Clint Seeley's original text is in green, and my editorial additions are in blue. Following is a tabular compilation of the models noted in the text. The name of the manufacturlng firm was Dowst Brothers Co. prior to 1926, The Dowst Manufacturing Co. from 1926 to 1964, and The Strombecker Corporation since 1964. 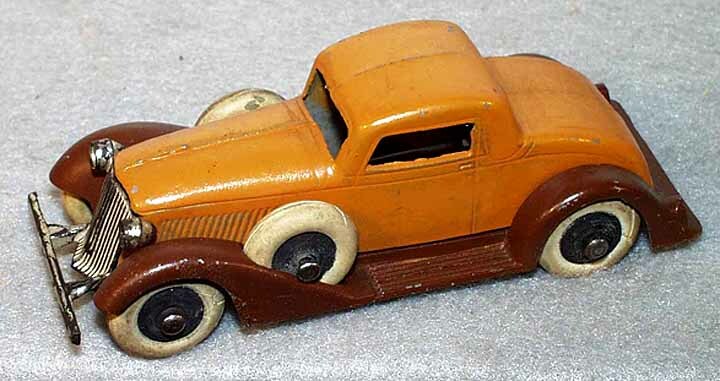 However, these tables are limited to automotive toys made prior to 1941. The catalogue numbers seem to lack consistency and do not follow a tidy chronological sequence. A very large number of very small Items preceded most of the items listed here, and careful study of the 64 page catalogue of 1909 suggests that there had probably been some order which had provided the basic foundation upon which the later chaos had gradually been built. Listing here will be roughly chronological, following numerical sequence only when similar numbers fall closely together. I have rearranged Clint's order here and there where it seems more logical to me. 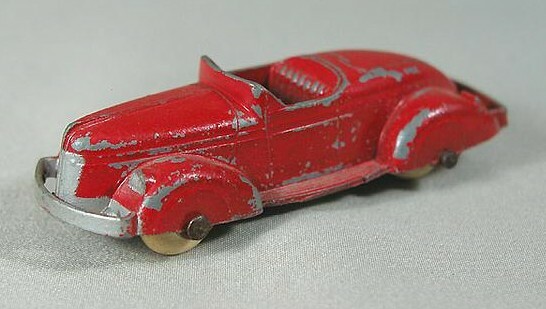 The first toy cars fell into a category of items numbered in the four thousands, and so the early cars pick up here and wander upward before encountering discontinuities which jump back down to lower numbers, even reaching 23 for the little racer bearing that number on its radiator, and eventually getting back to repeat nos.4634 and 4635. 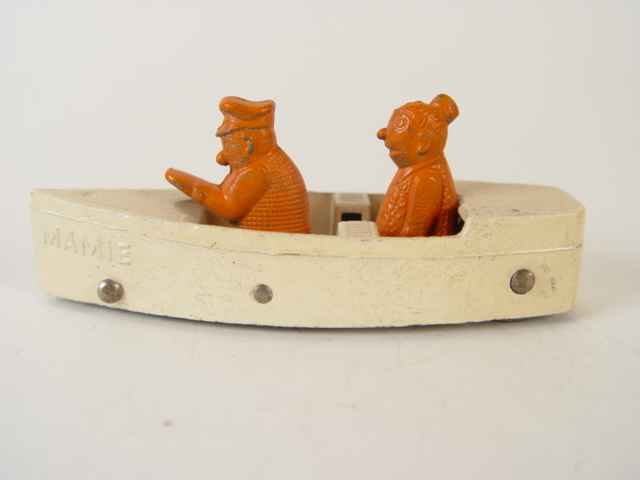 Many omitted numbers referred to non-automotive items, while others just seem to have sunk without a trace. 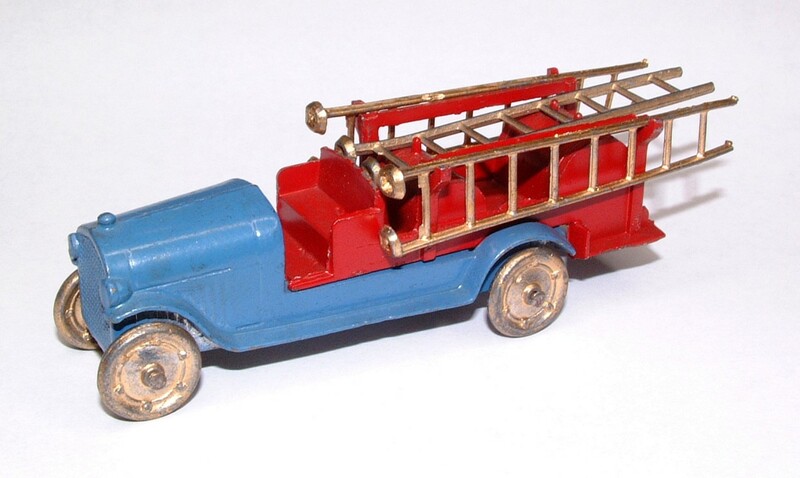 Dates of first and last appearance in the catalogue include years in which a model may only have been shown in a boxed set while not being listed under its own number; a few models never appeared individually, and are thus listed here without any catalogue number. 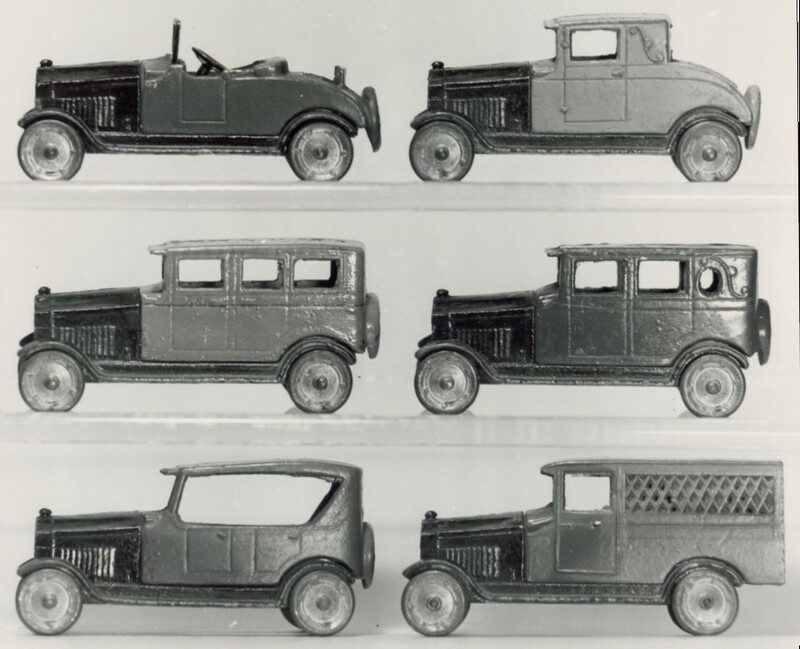 In 1933 all models issued with rubber tyres were given an "0" prefix, whether added to older models with optional tyres or on new models issued only rubber-shod. The "0" was dropped in 1937 and later catalogues and is not shown here, except (in the comments column) where optional tyres exist. Dates before 1925, and in 1927 and 1928 are estimated, and could be off by a year, but not likely more. Listed under "designation" is the name or names shown for the item in the catalogues. Many Items are known among collectors by some other title, and this is noted in parenthesis. Markings on the outside of the casting are shown in double quotes under "comments". The lengths may be off by a millimetre or so, due to swelling or distortion of some of the castings, to poor lighting in the museum storage vaults, the author's failing vision or shaking hand or some other alibi. 1928 47 Spoked wheels until about 1927, then disc. "TOOTSIETOY" not cast on model. 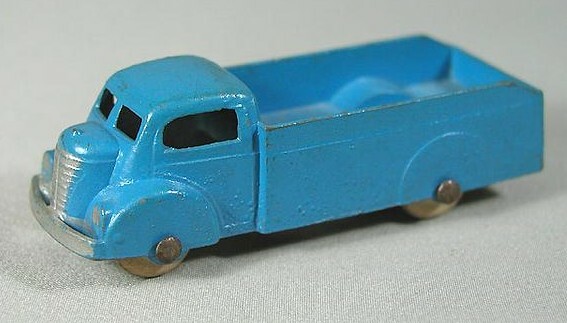 1926 77 Prior to being listed as 'Ford' called 'well-known flivver'. Spoked wheels until about 1923, then disc. "TOOTSIETOY" not cast on model. 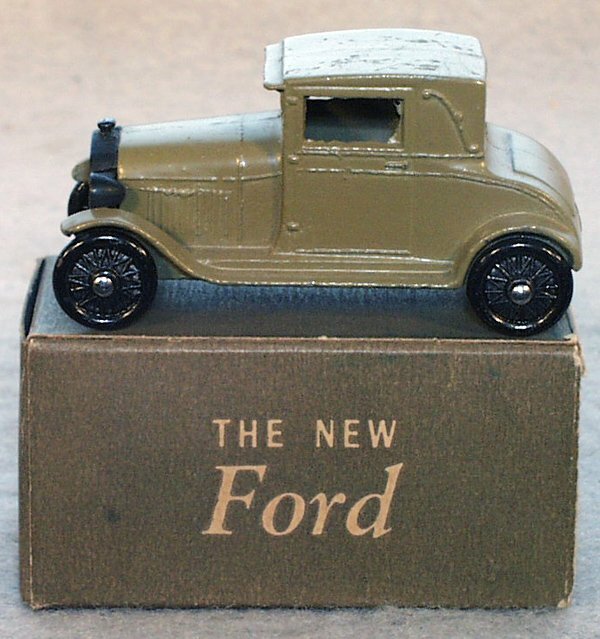 1932 77 Not named 'Ford' until a boxed set of 1929. Earlier 'companion to flivver'. Spoked wheels until about 1923, then disc. 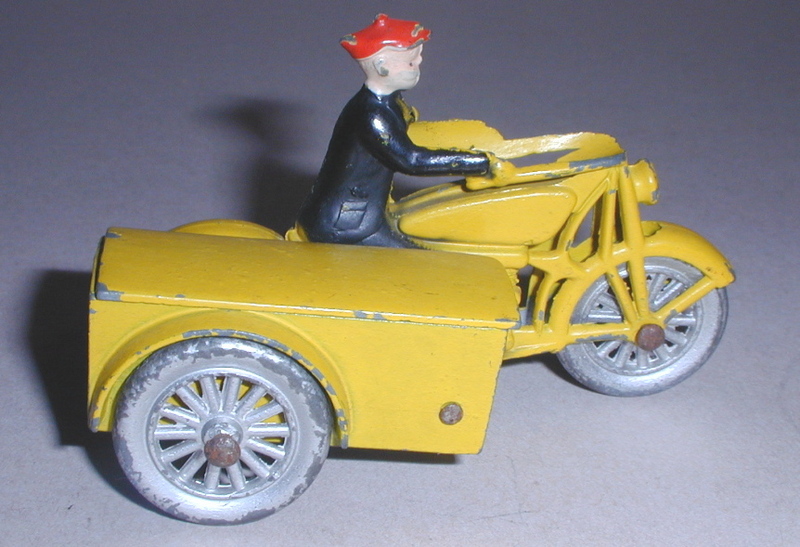 Without or with "TOOTSIE TOY" cast on model. 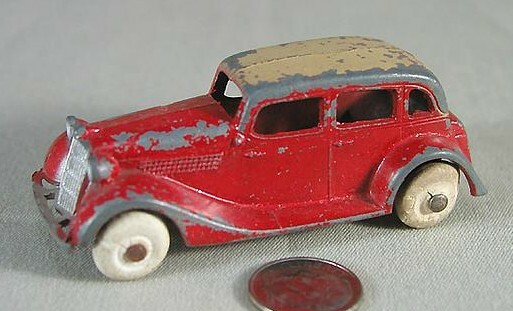 1933 72 Without or with "TOOTSIE TOY" cast on model. 1933 75 "GROCERY", "BAKERY", "MARKET", "LAUNDRY", "MILK" or "FLORIST", though some of these may have dropped out during earlier years, "GROCERY" being the only catalogue illustration by 1931. Without or with "TOOTSIETOY" cast on model. 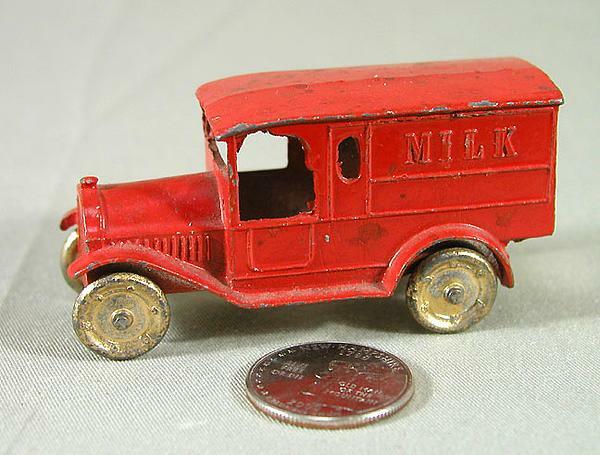 No.04630 with rubber tyres issued 1933 (only "MILK" is known). For the special versions with department store names, see the list in part 2. 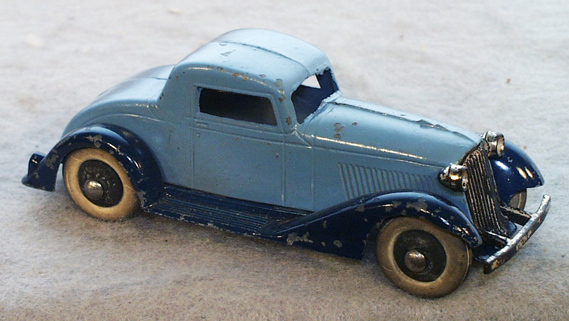 1933 76 The much copied five-passenger coupe. 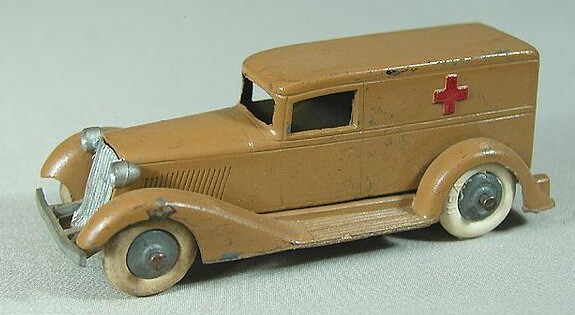 Without or with "TOOTSIE TOY" cast on model. 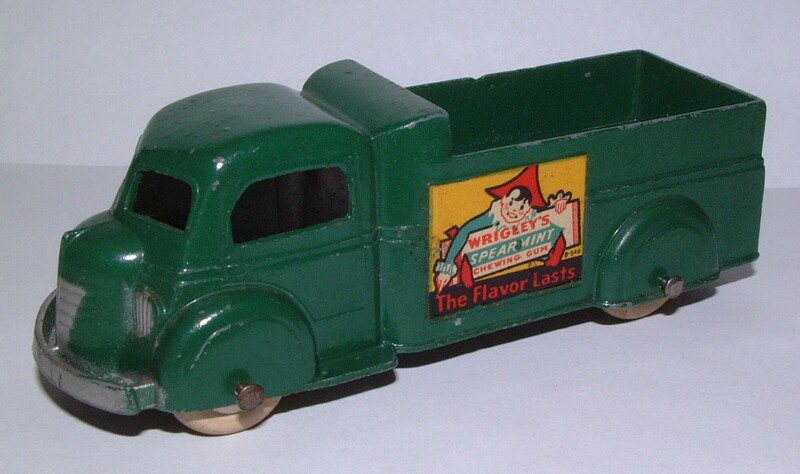 1933 82 The name was spelled 'Mack' by 1928, by which time the trademark "M" emblem was cast into the front. 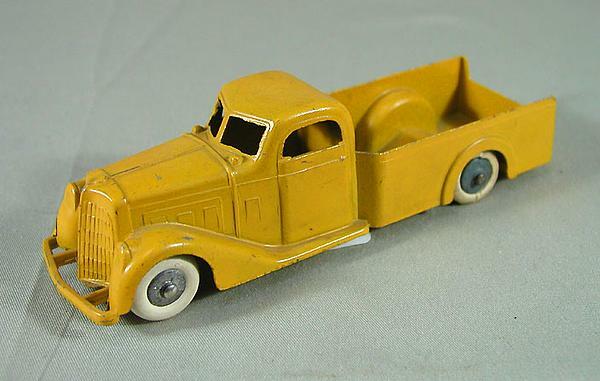 Without or with "TOOTSIE TOY" cast on model. 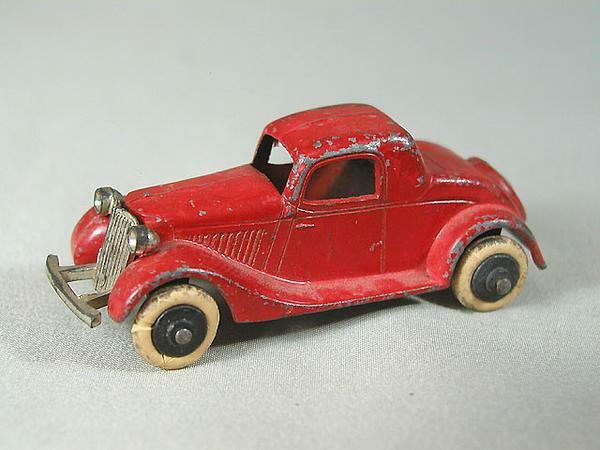 No.04638 with rubber tyres issued 1933. See 4638. 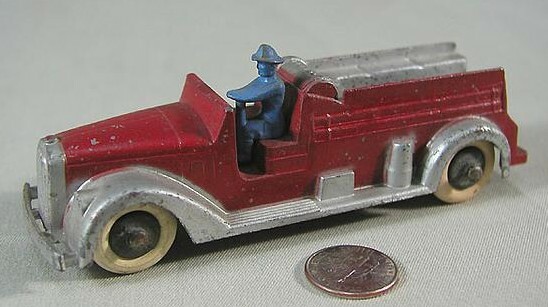 Without or with "TOOTSIE TOY" cast on model. 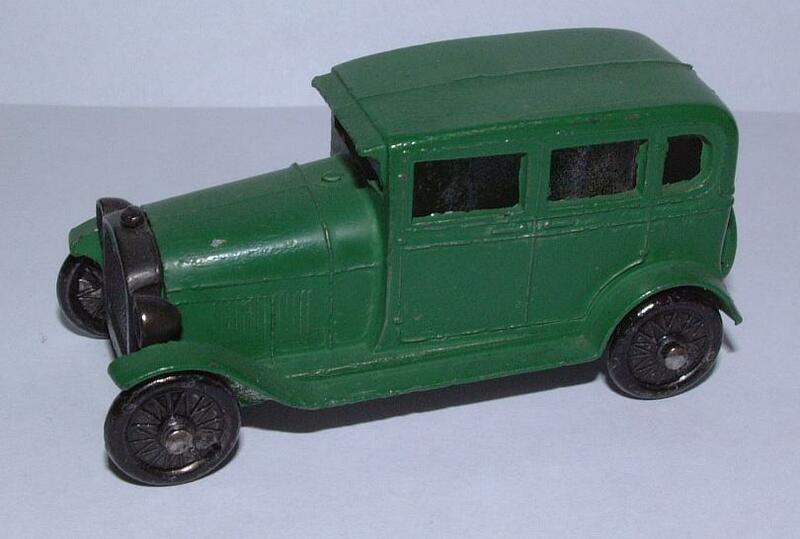 No.04639 with rubber tyres issued 1933. See 4638. 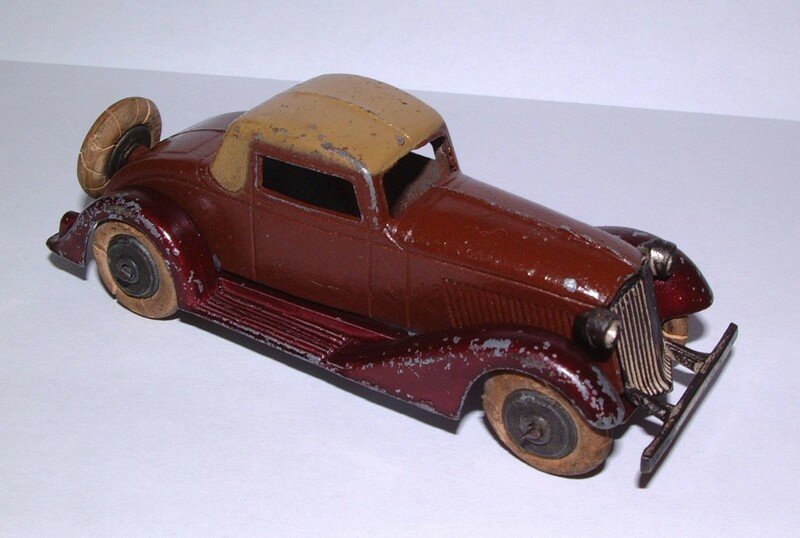 Without or with "TOOTSIE TOY" cast on model. 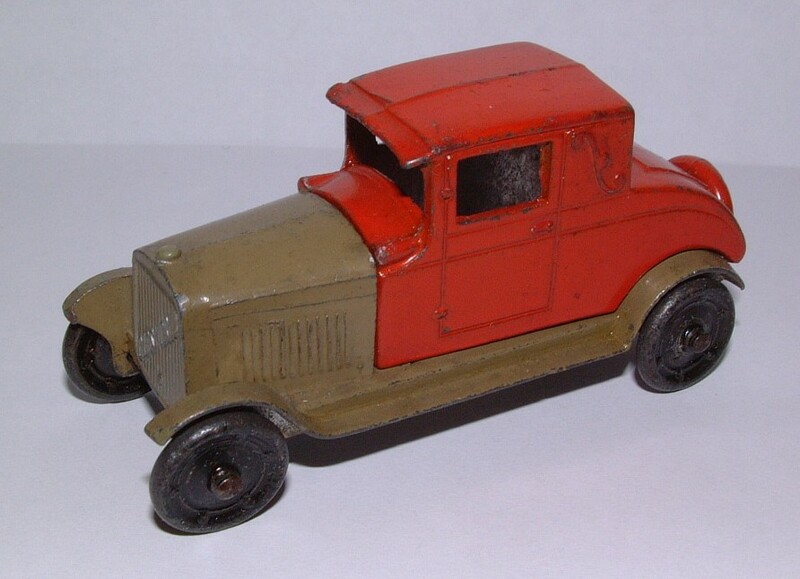 No.04640 with rubber tyres issued 1933. 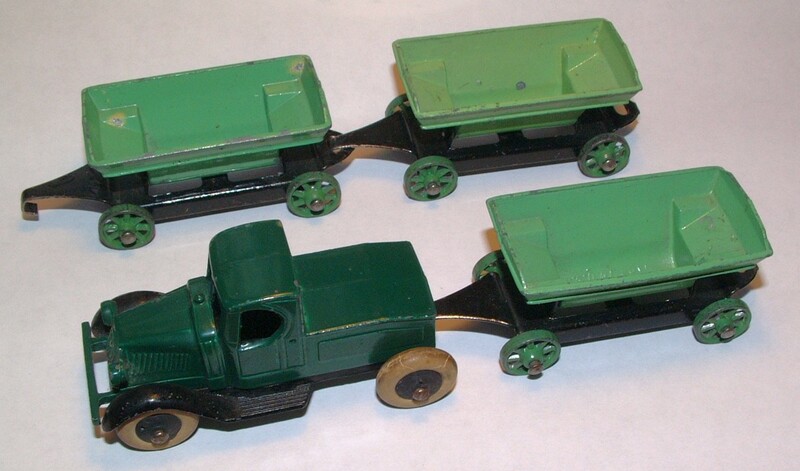 Boxed set with one Mack chassis and the above three bodies. 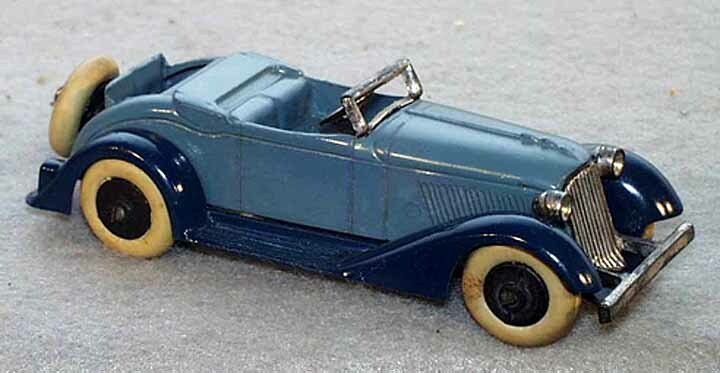 1933 78 'One of the latest models of a popular make of Touring Car' it says in the catalogue. 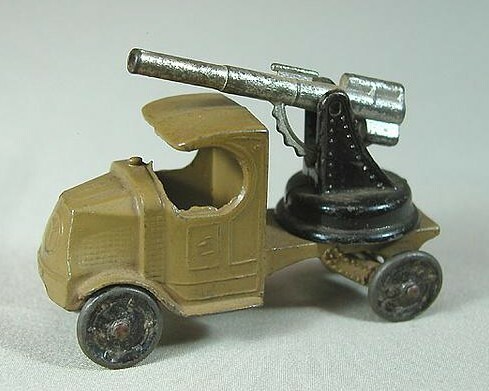 Without or with "TOOTSIE TOY" cast on model. 1933 74 Removable driver, later fixed onto seat. "23" cast on grille. 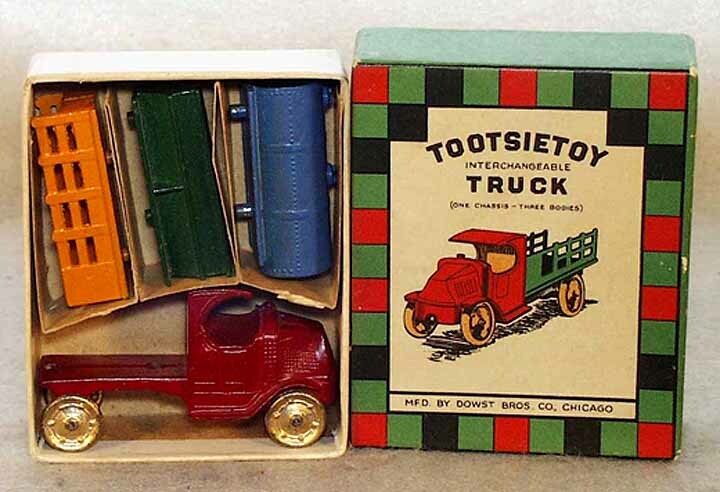 Without or with "TOOTSIE TOY" cast on model. 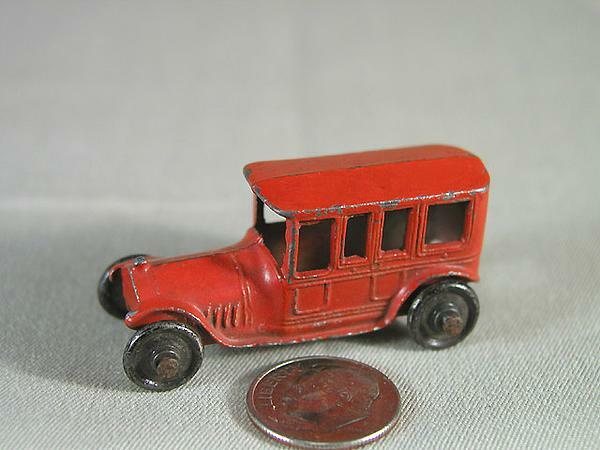 No.023 with rubber tyres issued 1933. 1941 95 Towed by either no.4654 or 4646. 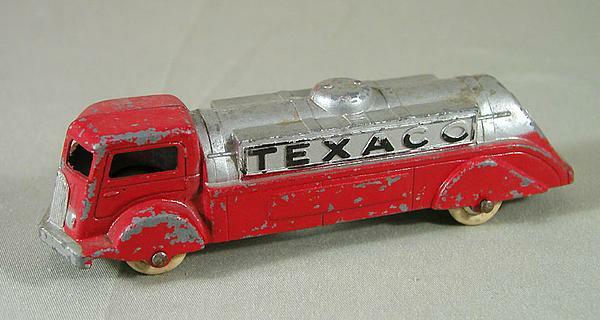 1941 70 This, the searchlight truck and no.190X car transport were the only 'early Macks' to be cast in zamac after 1933. 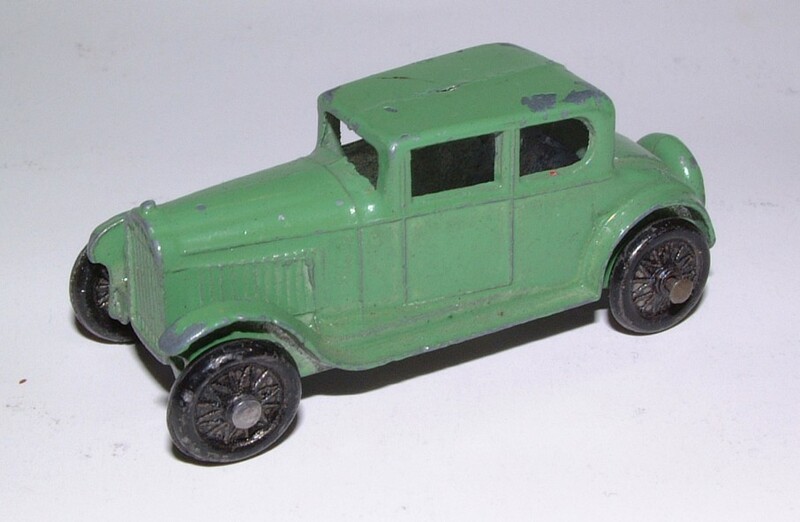 No.04643 with rubber tyres issued 1933. 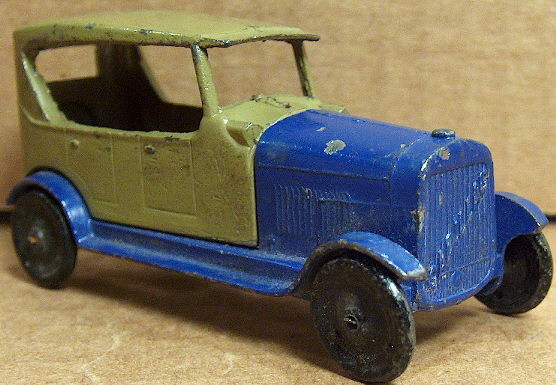 1941 70 No.04644 with rubber tyres issued 1933. 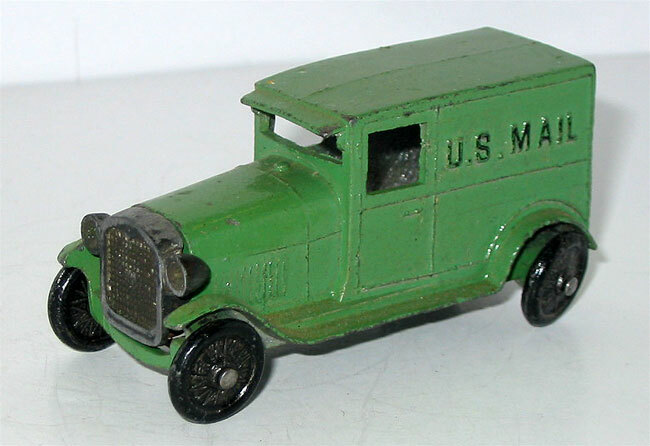 1933 76 "US MAIL AIR MAIL SERVICE" cast on sides. 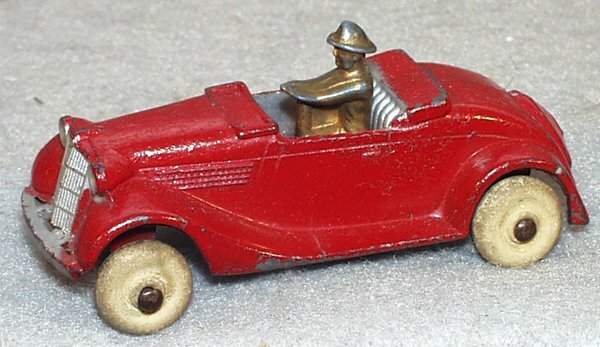 No.04645 with rubber tyres issued 1933. 1939 77 Driver integrally cast. 1934 73 Obviously from a diesel prototype. We have a tendency to be sloppy with the terms 'steam roller', 'steam shovel' etc. 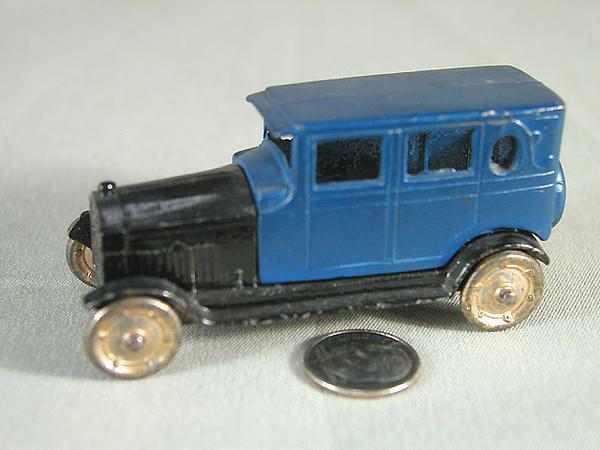 No.04652 with rubber tyres issued 1933. 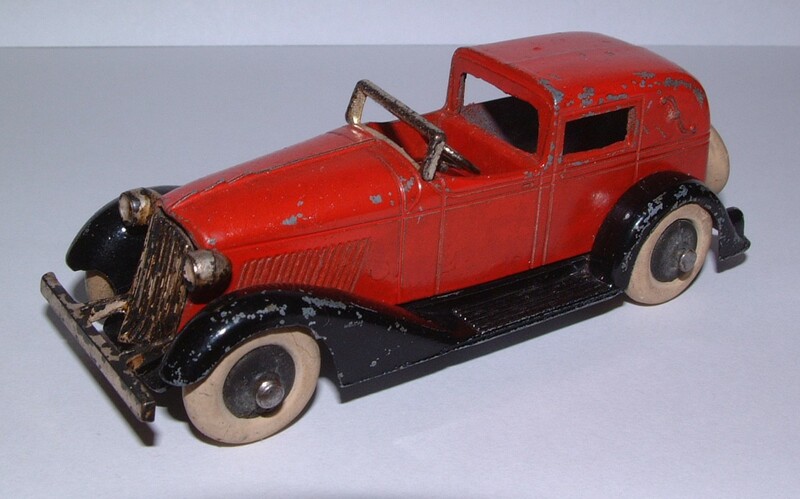 1933 91 No.04653 with rubber tyres issued 1933. 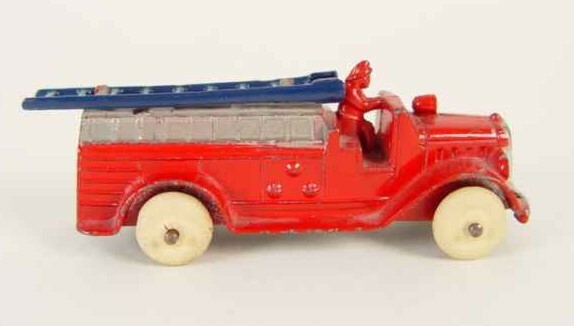 Boxed set with one chassis and the above two bodies. 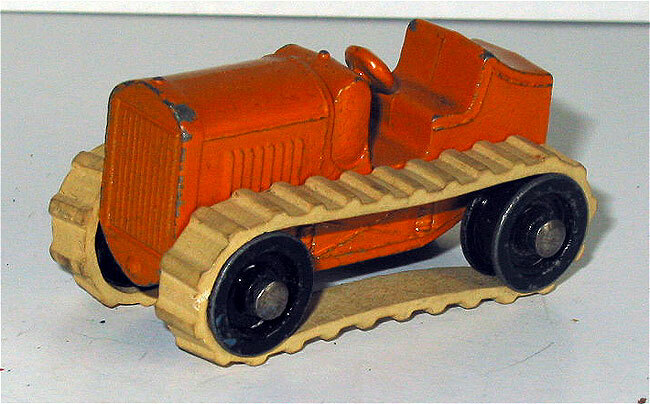 1932 76 The early farm tractor. Without or with towing loop. 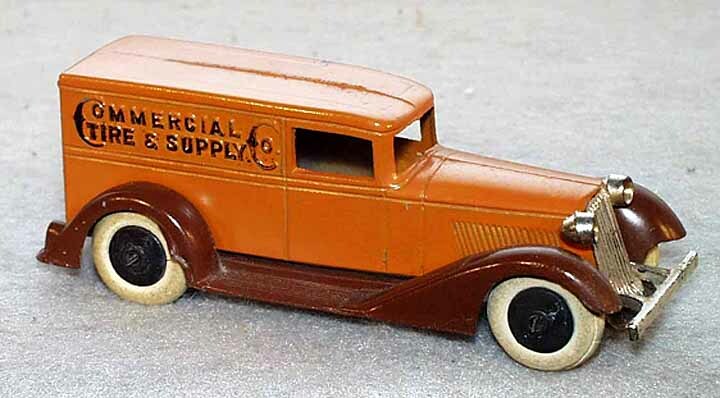 1932 67 ) Sold only with 4610 Model T Ford Truck and 4654 Tractor in boxed sets nos.5010 and 7003. 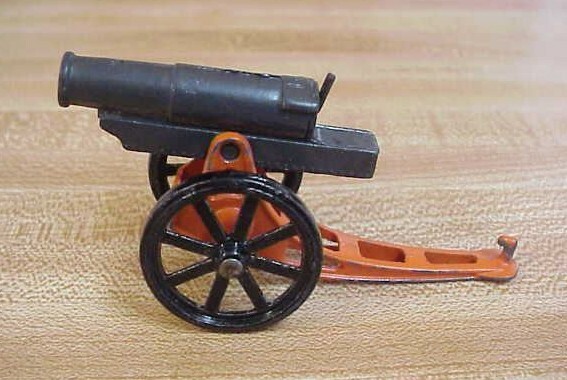 1932 76 US Army modification of no.4654, sold only in boxed set no.5071 Field Battery Set with cannons 4642 and 4662. 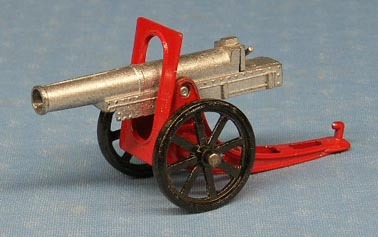 "USA W-1881" cast on ammunition box. 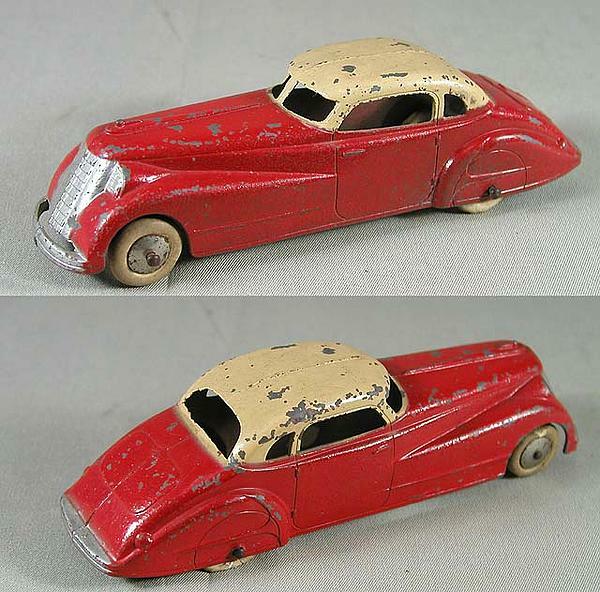 1933 65 Sold in individual box. No.04655 with rubber tyres issued 1933. 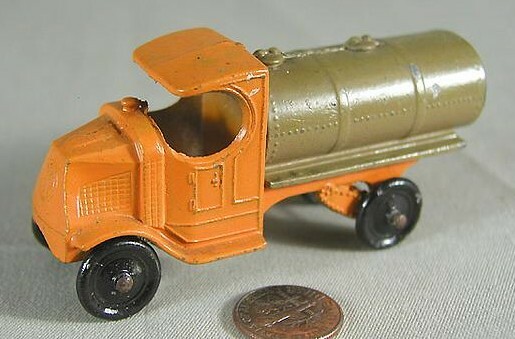 1932 58 Tinplate garage 65mm long. Coupe issued from 1930 as no.101. Without or with "TOOTSIETOY" cast on model. 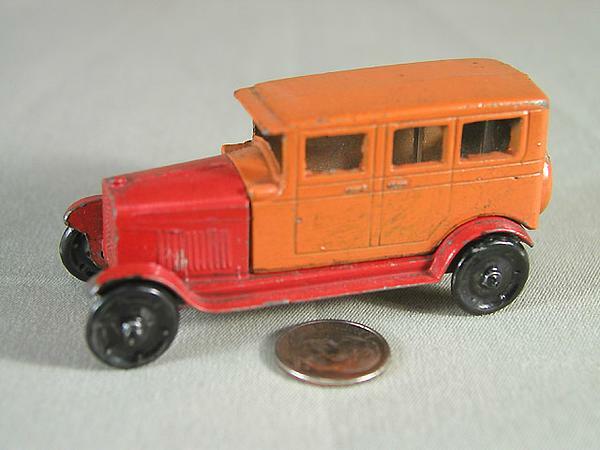 1932 58 Tinplate garage 65mm long. 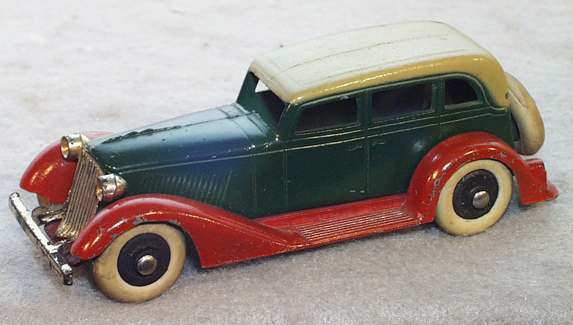 Sedan issued from 1930 as no.103. Without or with "TOOTSIETOY" cast on model. 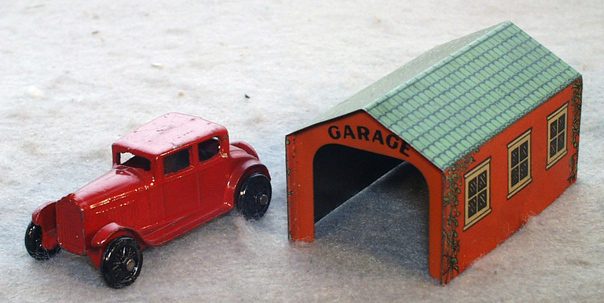 1932 58 Tinplate garage 65mm long. 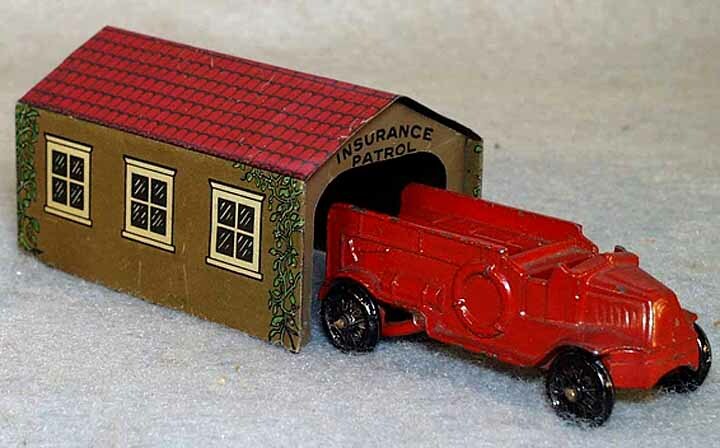 Insurance Patrol issued from 1932 as no.104. Without or with "TOOTSIETOY" cast on model. Companion to no.4655. Sold in individual box. No.04665 with rubber tyres issued 1933. 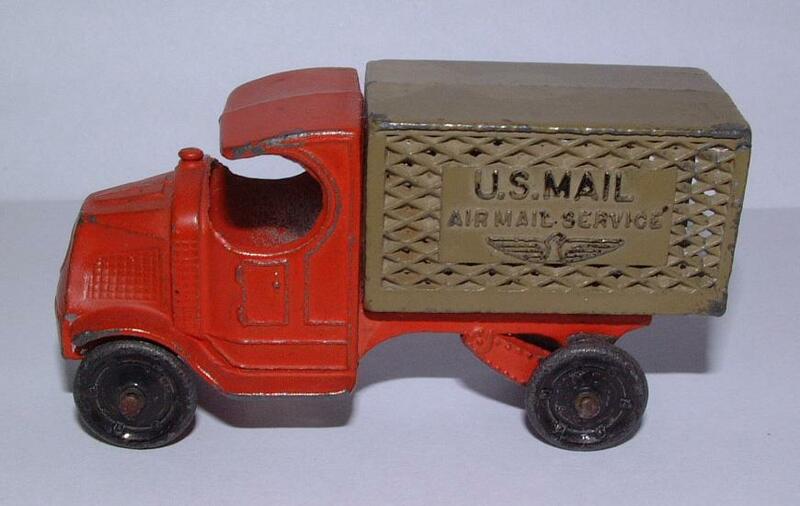 1933 66 Sold only in the 'Air Mail' boxed set no.5041 with Mack Airmail Van no.4645, pylon, planes and figures. 1941 95 'World's Fastest Racer'. "TT" on sides. No.04666 with rubber tyres issued 1933. 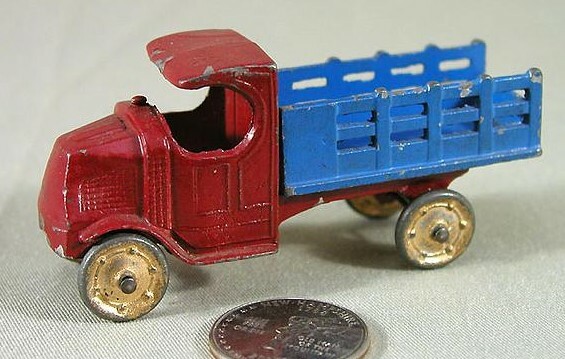 1932 100 Mack tractor with two semi trailers: "A&P" and "AMERICAN RAILWAY EXPRESS". 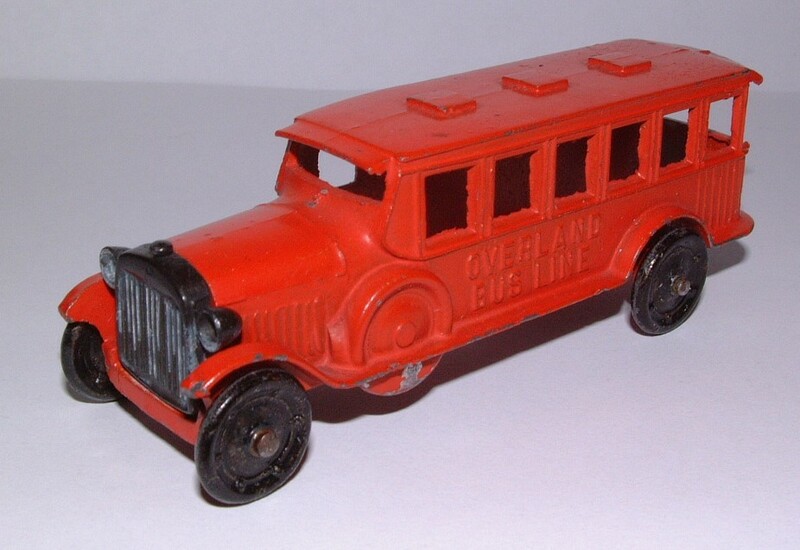 1933 95 "OVERLAND BUS LINE" on sides, "OVERLAND" at rear. Separate grille piece. No.04680 with rubber tyres issued 1933. 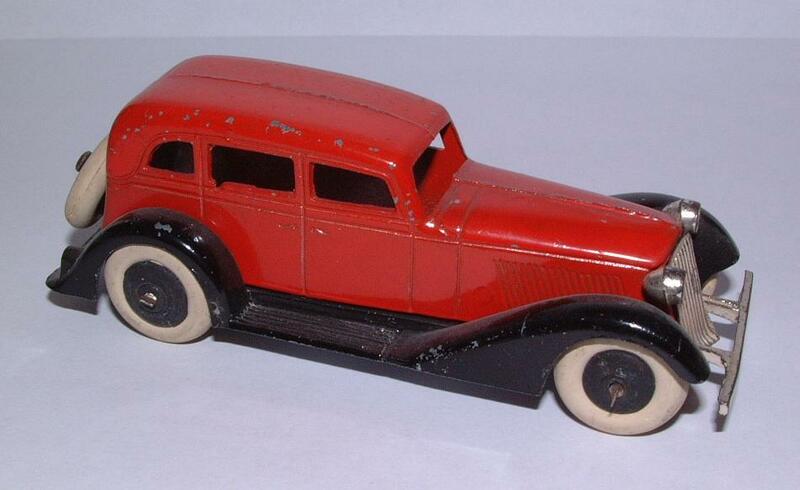 1933 215 Red, with two Buick sedans (103) and one coupe (101). 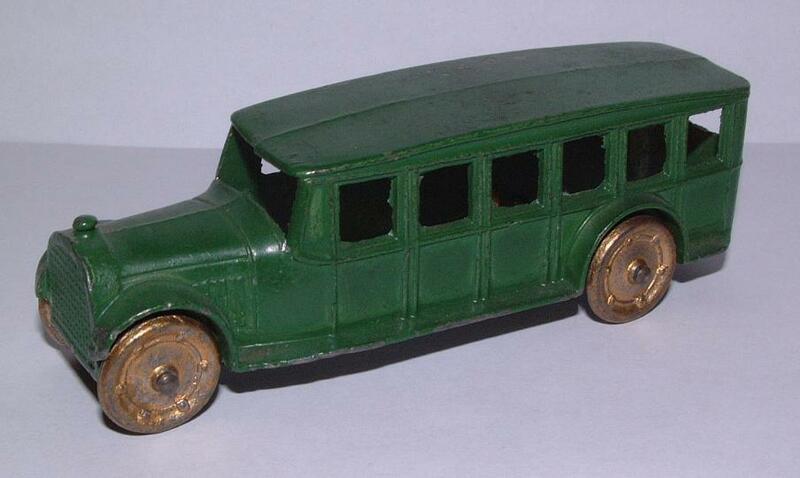 No.0190 with rubber tyres issued 1933. 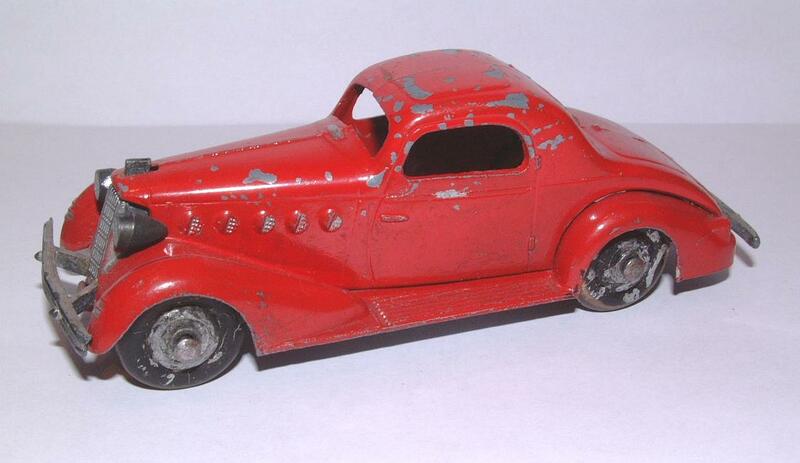 1936 272 Red, with two Buick sedans (103) and two coupes (101). The length measurements might vary a bit due to different degrees of tilt of the rear spare tyres. 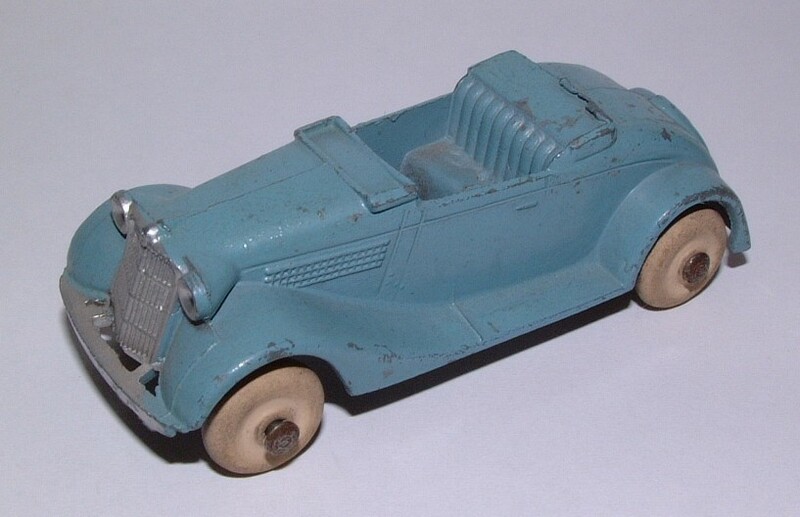 Colours varied in different years, the body always different from the chassis. Wheels were black in some years, gold in others. 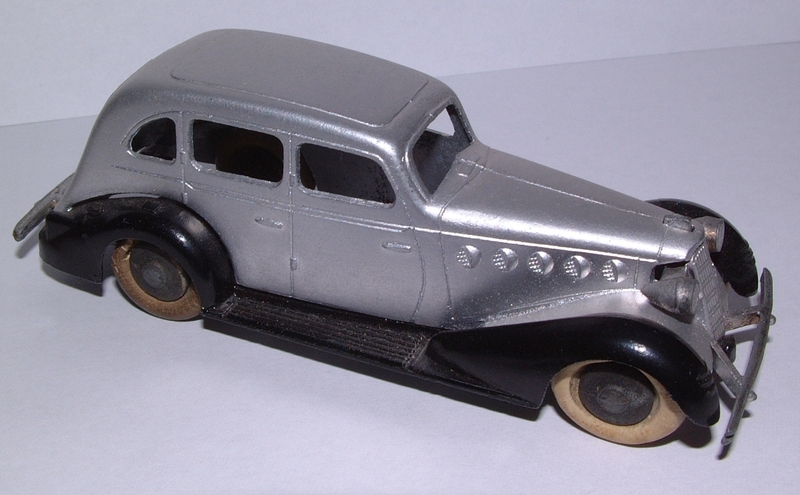 1933 79 "Buick" on grille. 1933 77 "Buick" on grille. 1933 82 "Buick" on grille. 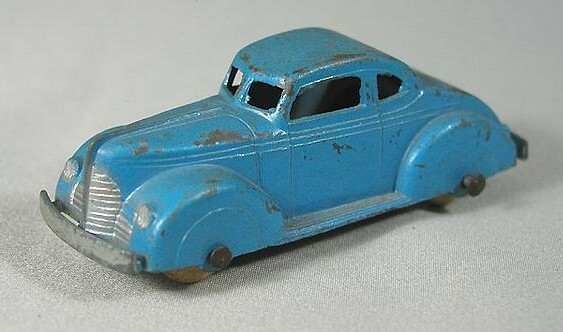 1933 79 "CADILLAC" on grille. 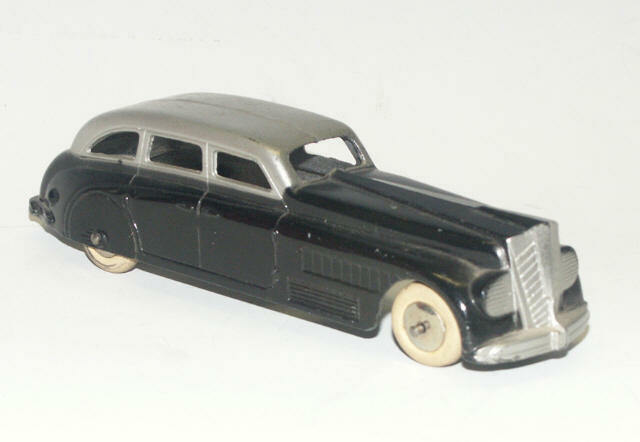 1933 77 "CADILLAC" on grille. 1933 82 "CADILLAC" on grille. 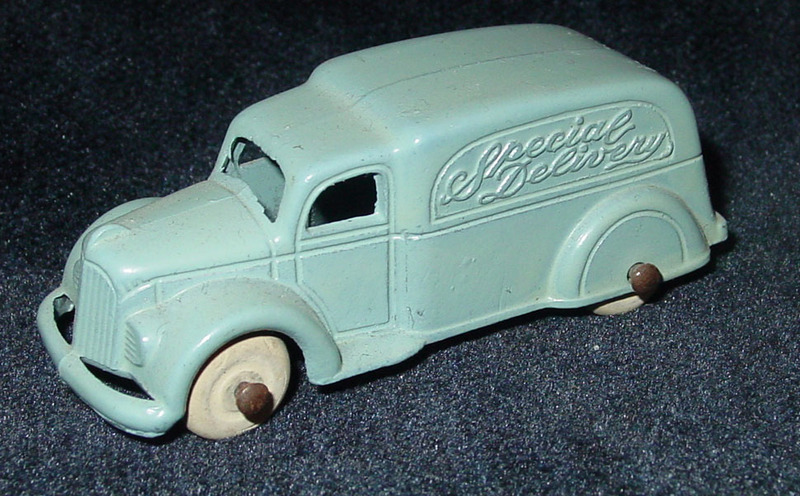 1933 79 "CHEVROLET" on grille. 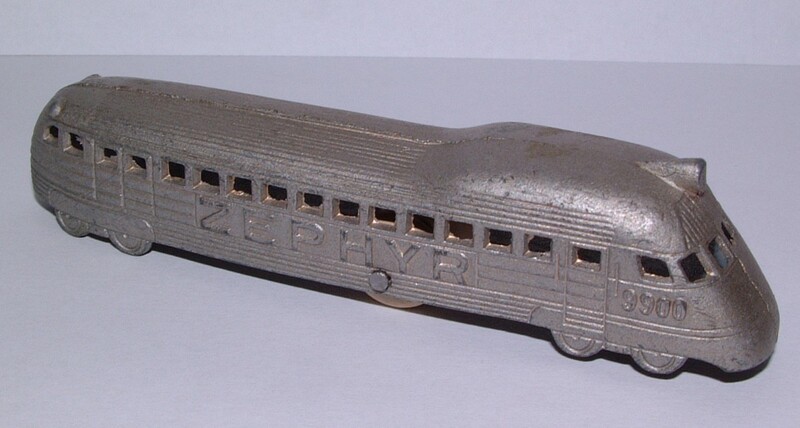 1933 77 "CHEVROLET" on grille. 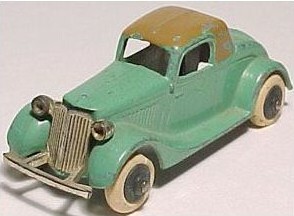 1933 82 "CHEVROLET" on grille. 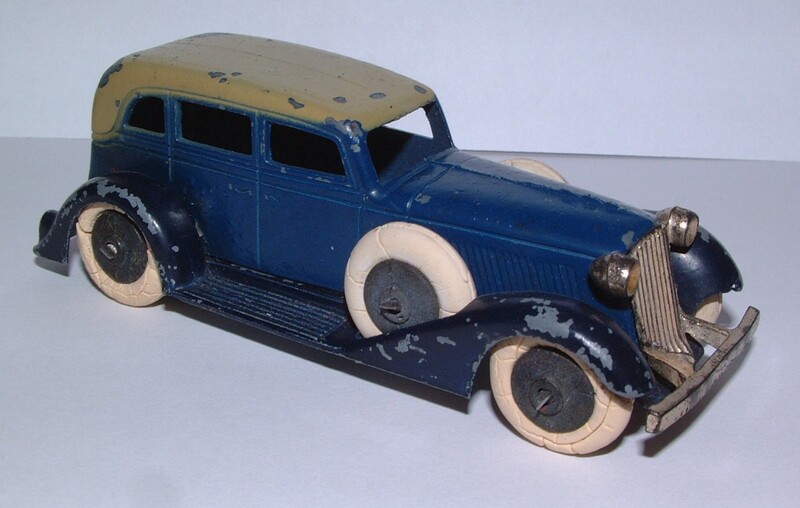 1933 79 "OLDSMOBILE" on grille. 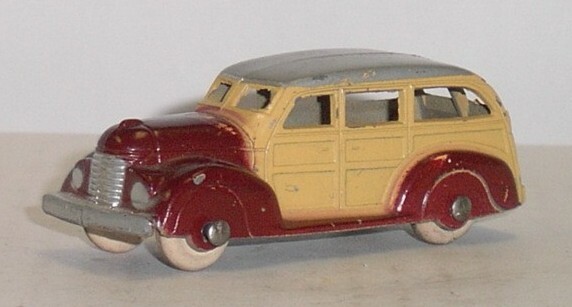 1933 77 "OLDSMOBILE" on grille. 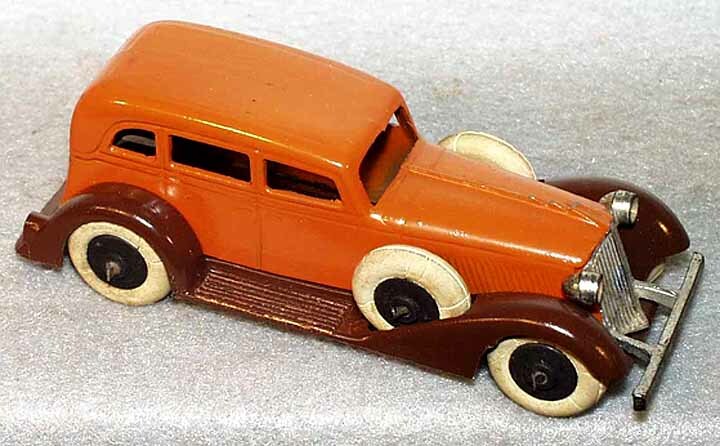 1933 82 "OLDSMOBILE" on grille. 1933 79 No name on grille. 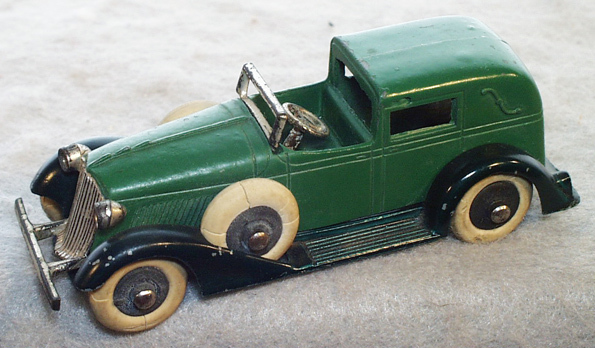 No.06-01 with rubber tyres issued 1933. 1933 77 No name on grille. 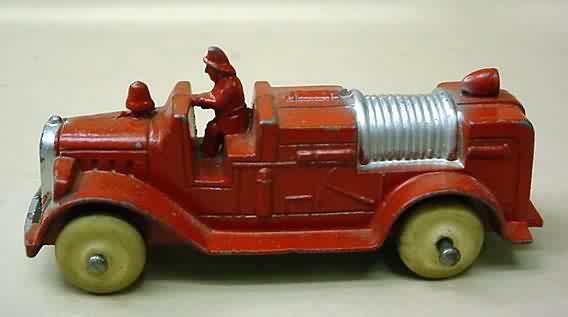 No.06-02 with rubber tyres issued 1933. 1933 79 No name on grille. 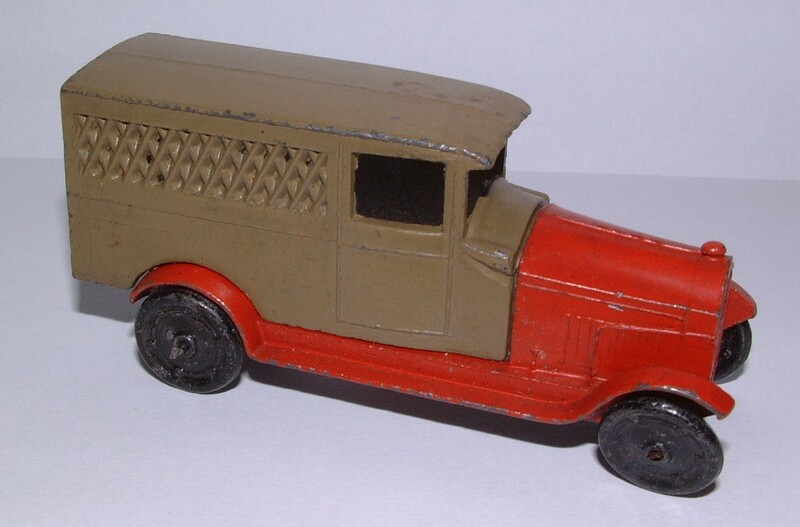 No.06-03 with rubber tyres issued 1933. 1933 79 No name on grille. 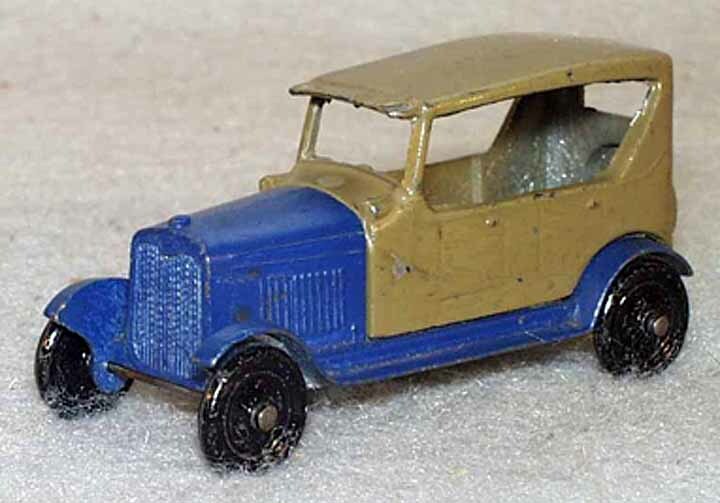 No.06-04 with rubber tyres issued 1933. 1933 79 No name on grille. 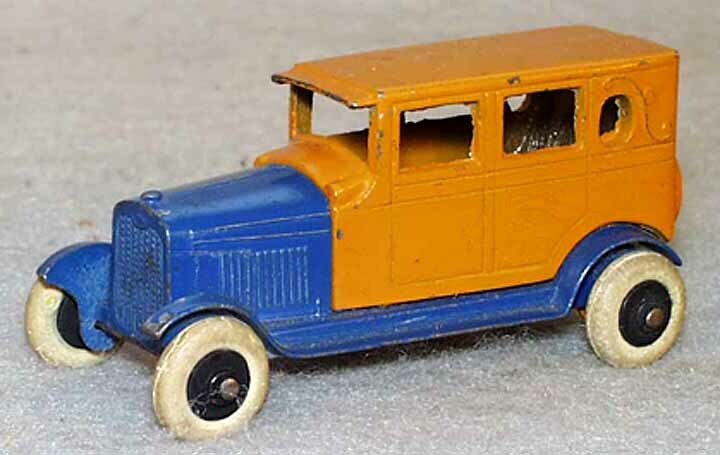 No.06-05 with rubber tyres issued 1933. 1933 82 No name on grille. 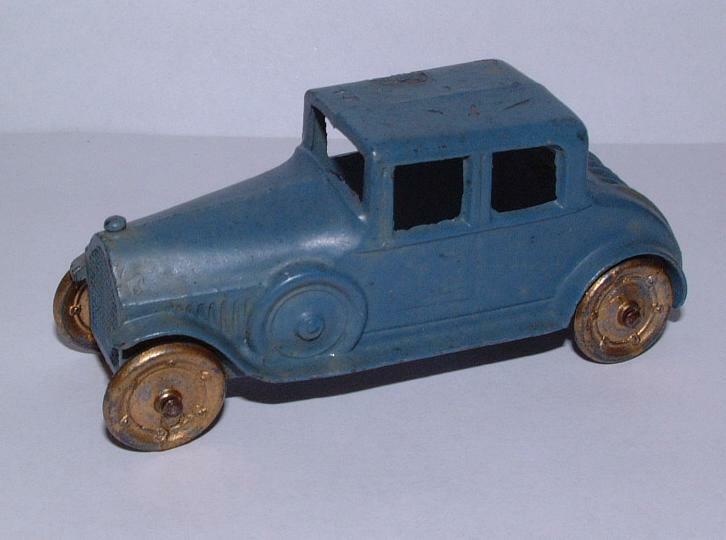 No.06-06 with rubber tyres issued 1933. 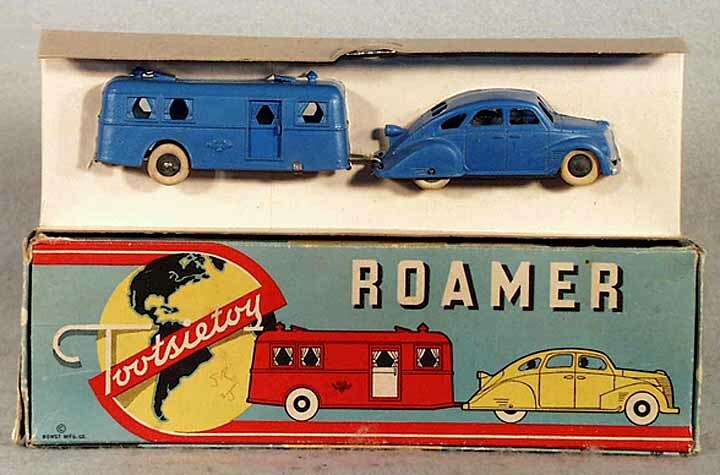 Contained 'action' versions of the models. 1933 70 "348" cast front and rear. 1933 78 See also no.807. 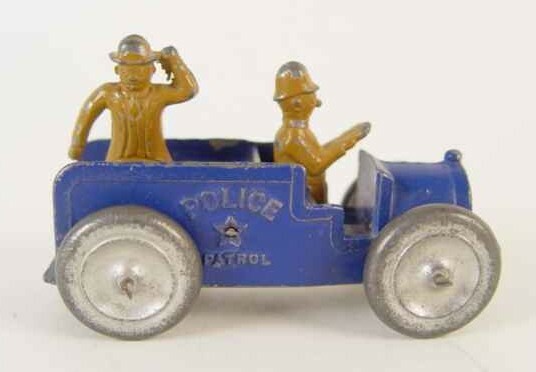 1933 73 "POLICE PATROL" on sides. 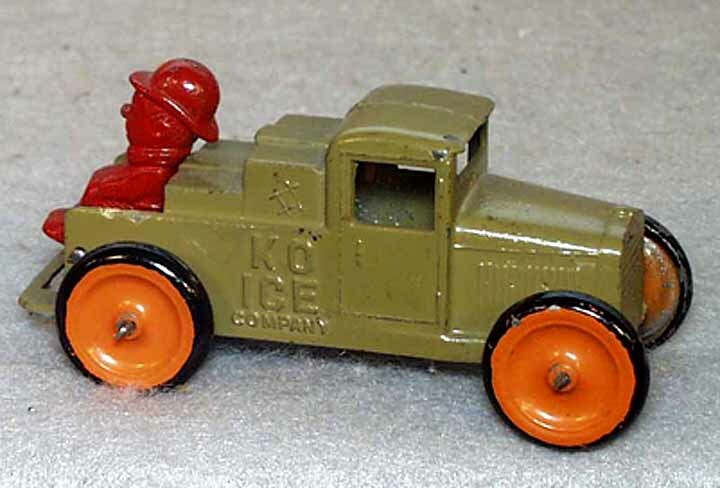 1933 74 "KO ICE COMPANY" on sides. 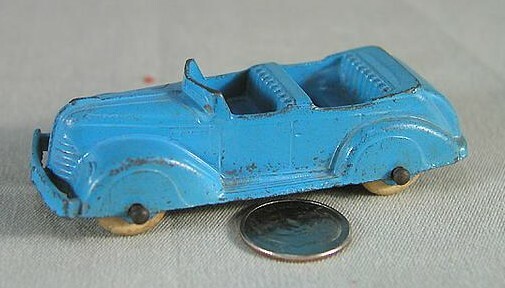 1933 84 "MAMIE" on sides. 1934 58 See no.4656. Without or with "TOOTSIETOY" cast on model. 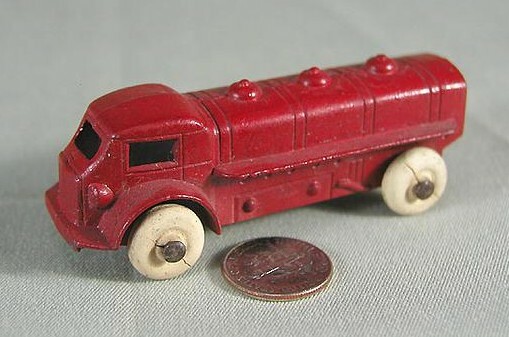 1934 58 Without or with "TOOTSIETOY" cast on model. 1934 58 See no.4657. Without or with "TOOTSIETOY" cast on model. 1934 59 See no.4658. Without or with "TOOTSIETOY" cast on model. 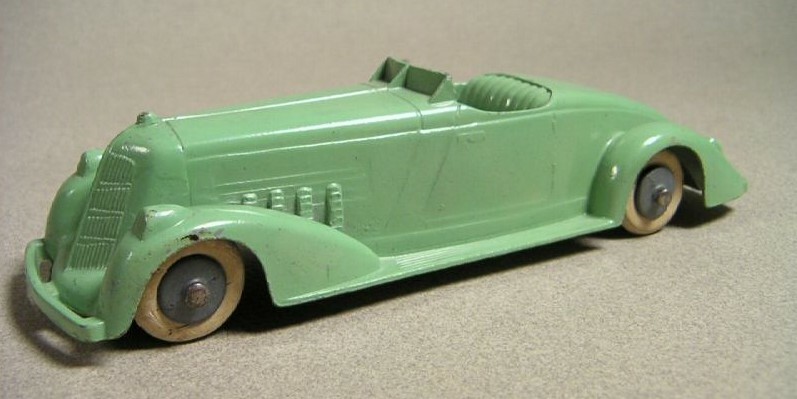 1934 57 "TT" on sides. 1934 68 The smaller one (compare 4666), no driver. 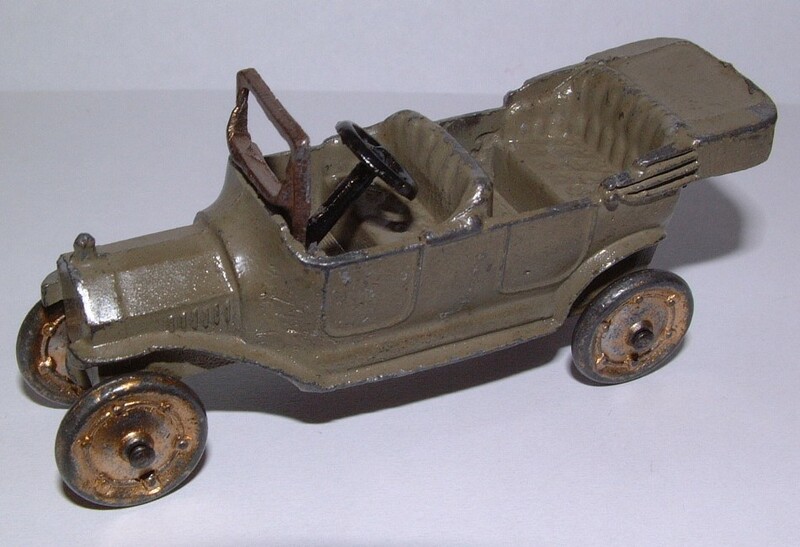 1941 76 1934 Ford (issued 1935) had separate grille and rubber tyres. 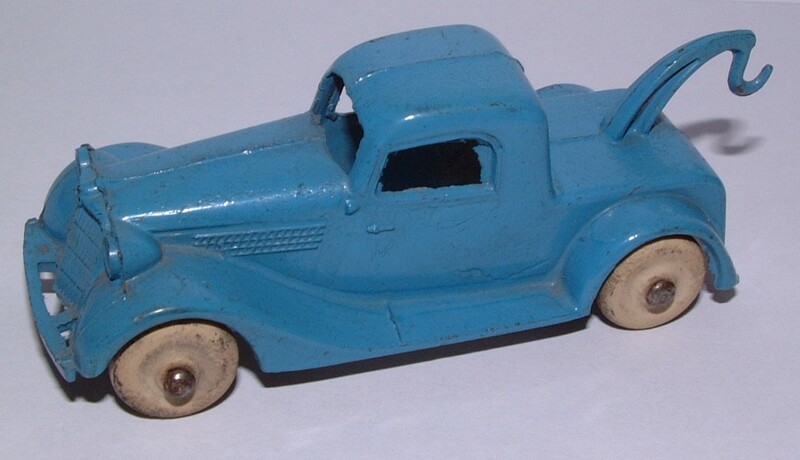 Redesigned as 1935 Ford (issued 1936), one-piece casting, solid rubber wheels. 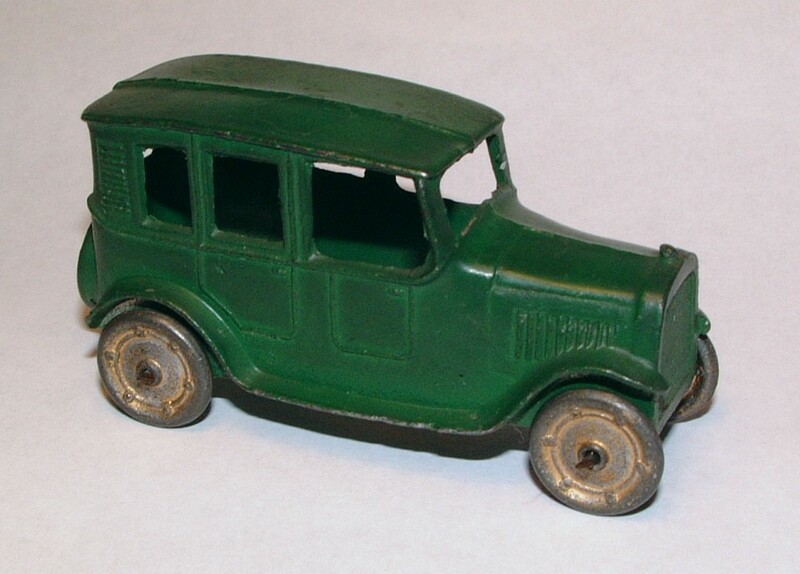 1941 81 1934 Ford (issued 1935) had separate grille and rubber tyres. 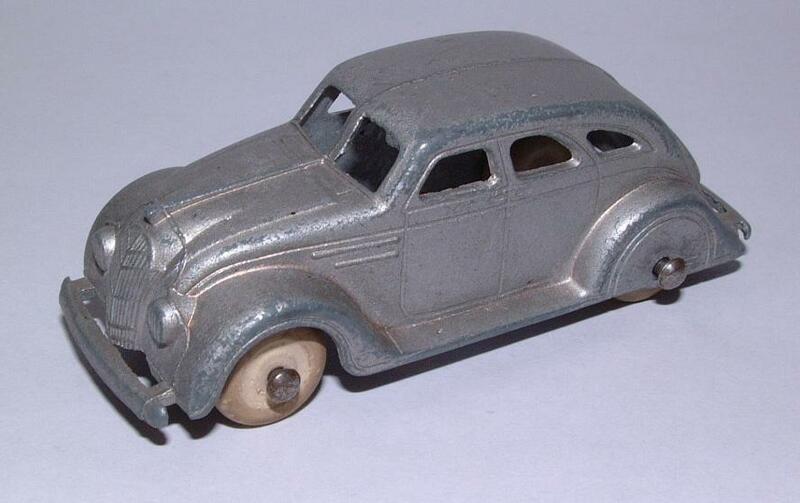 Redesigned as 1935 Ford (issued 1936), one-piece casting, solid rubber wheels. 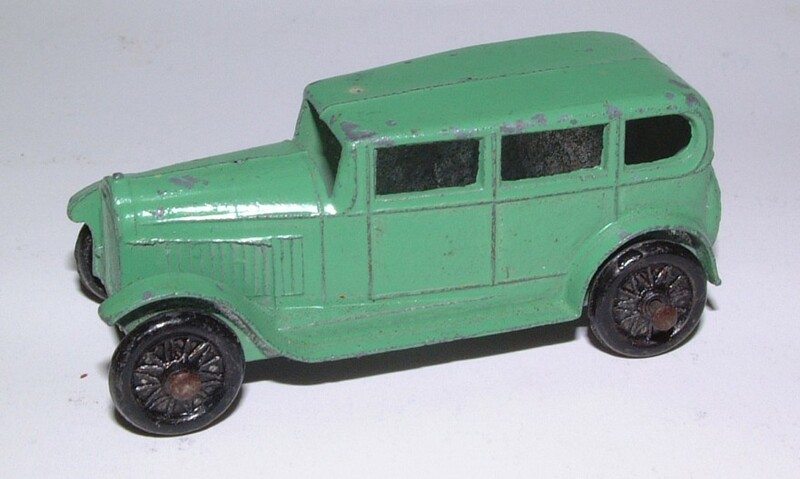 1936 76 1934 Ford (issued 1935) had separate grille and rubber tyres. 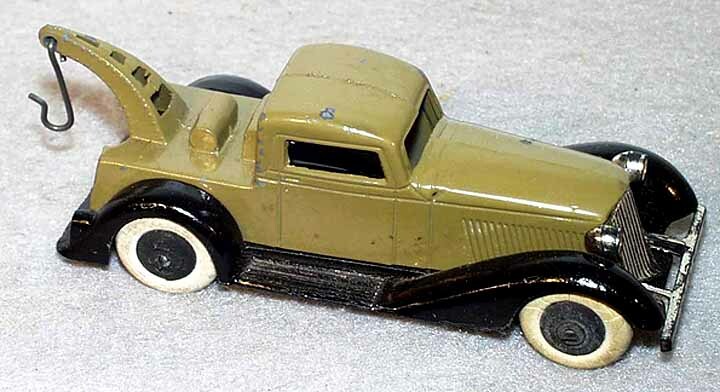 Redesigned as 1935 Ford (issued 1936), one-piece casting, solid rubber wheels. Differs from 112 only in paint finish. 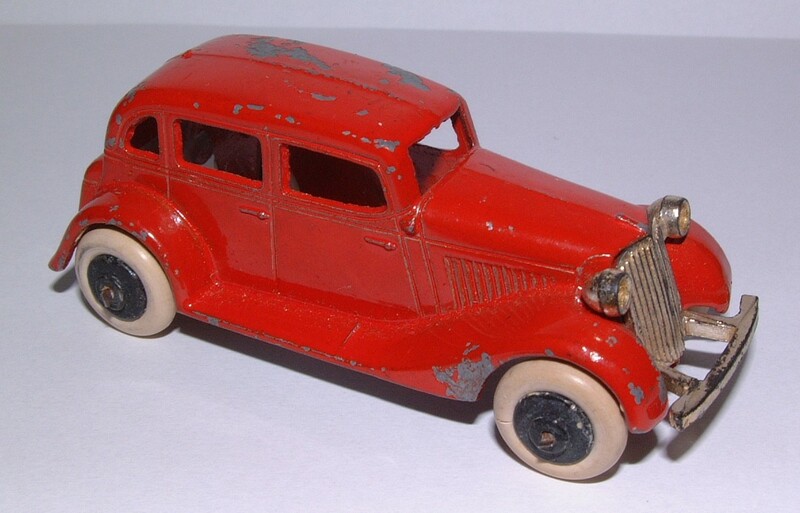 1936 76 1934 Ford (issued 1935) had separate grille and rubber tyres. 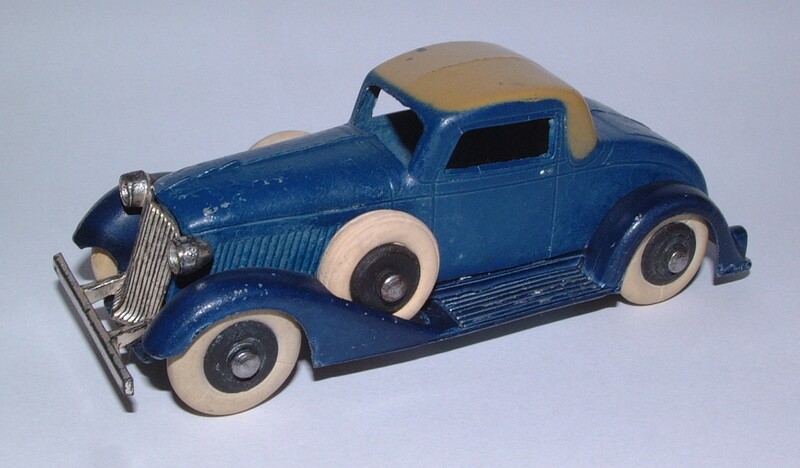 Redesigned as 1935 Ford (issued 1936), one-piece casting, solid rubber wheels. Differs from 111 only in paint finish. 1939 78 Probably not released until 1936 as a 1935 Ford. 1941 78 Sold only in boxed sets. 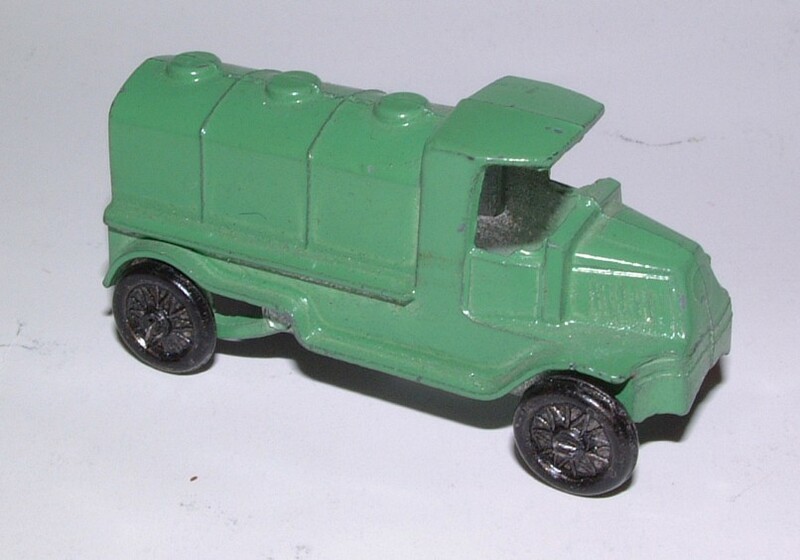 1936 97 I don't understand why Clint included this in the listing, since he omitted all the other Tootsietoy trains. 1939 77 "Special Delivery" and in custom liveries - see the table in part 6. Grahams, LaSalles, new Mack Trucks etc. Rear-mount spare wheel. Differs from 512 only in paint finish. Rear-mount spare wheel. Differs from 513 only in paint finish. 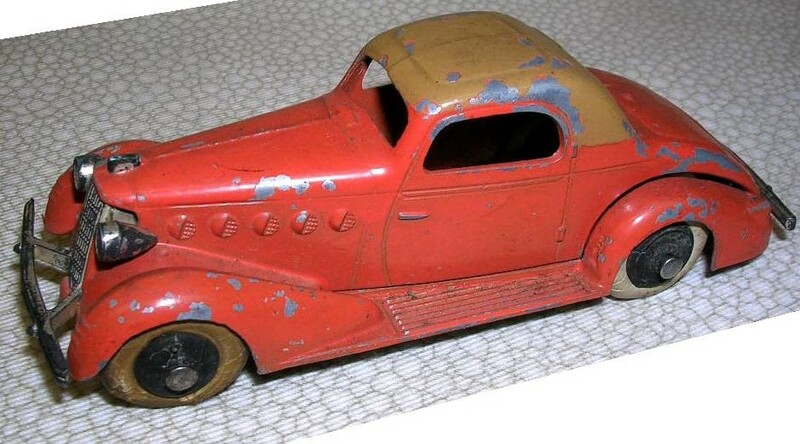 1936 98 Twin side-mount spare wheels. Twin side-mount spare wheels. Differs from 612 only in paint finish. Twin side-mount spare wheels. Differs from 613 only in paint finish. No spare wheel. 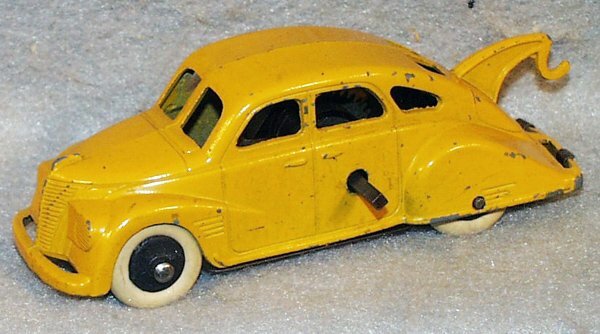 Shown only in boxed set 5360 'Bild-a-Car', but also sold with full axles. No spare wheel. Shown only in boxed sets 5360 'Bild-a-Car' and 5350 'Taxicabs'. Differs from 712 only in paint finish. 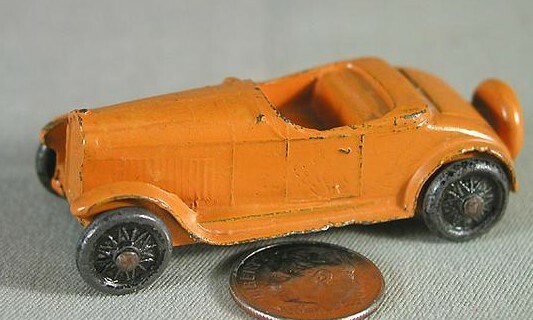 Differs from 713 only in paint finish. 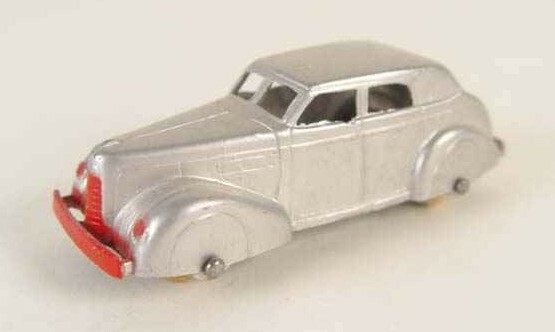 Not a good model of any real Lincoln Zephyr, being a Lincoln grille on the Doodlebug. With or without clockwork motor. Merely the above 'Lincoln' with tow boom. With or without clockwork motor. 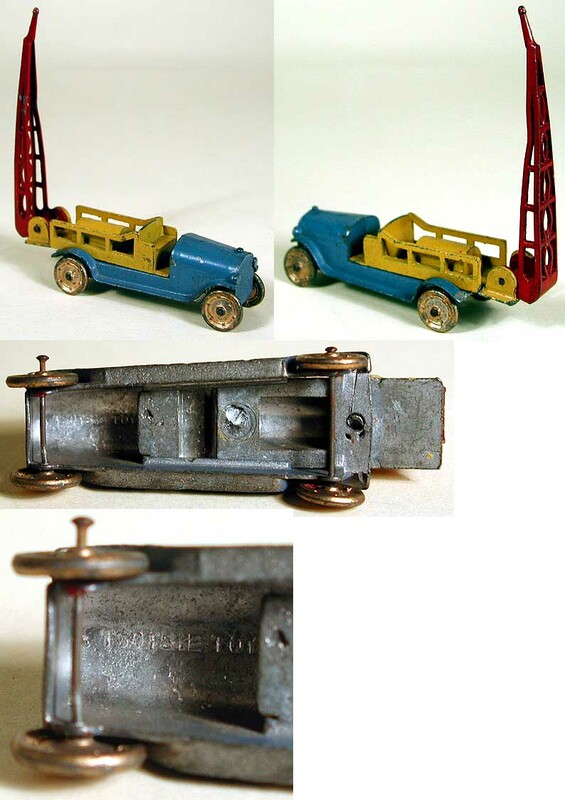 "TOOTSIETOY ROAMER" cast, steel floorplate and tow hook. 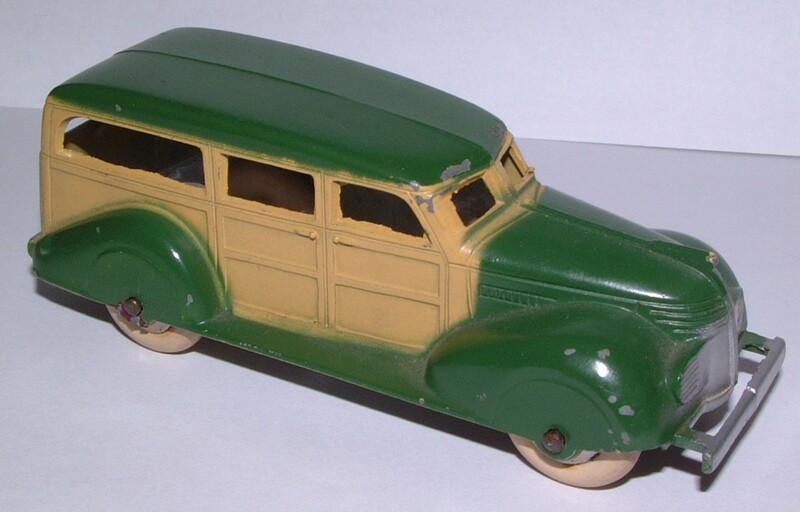 Sold singly only in 1937, then in set no.180. Boxed set of 6015 and1044. 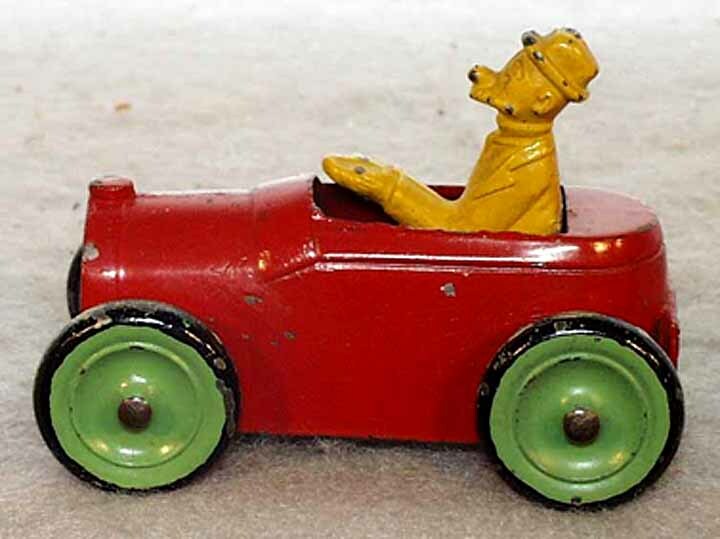 Clockwork motor in 1938 only. 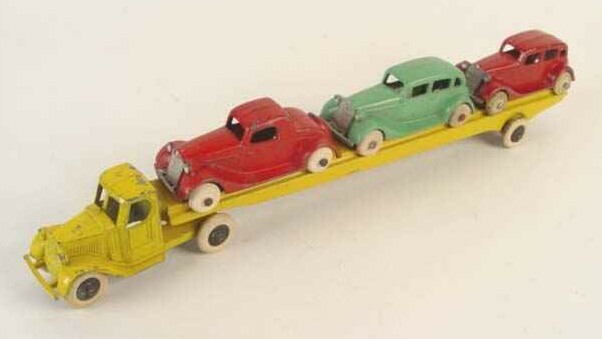 Sheet metal trailer carrying three up-tilted cars, one-piece tractor, single rear wheels. 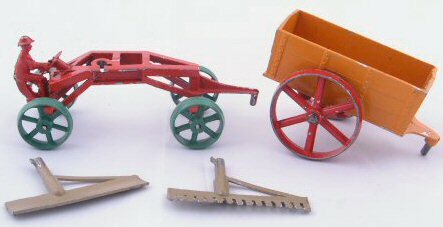 Side dumper trailers. Separate chassis on tractor with single rear wheels. One semi-trailer and two full trailers, all with "TOOTSIETOY DAIRY" printed. 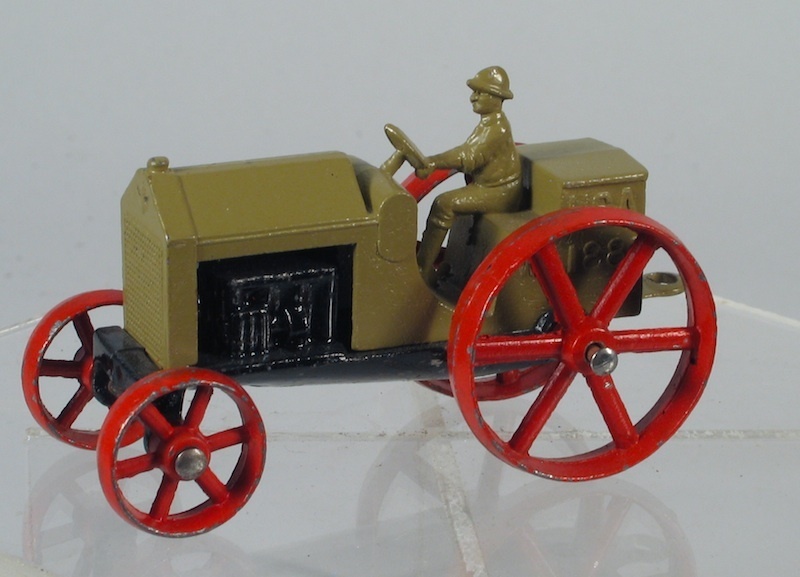 1st type tractor with separate chassis, 2nd type one-piece tractor, single rear wheels on both versions (see 805). 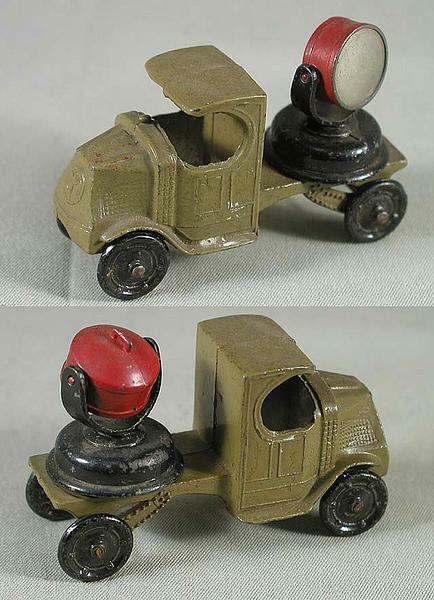 1st type tractor with separate yellow painted chassis, 2nd type one-piece tractor, single rear wheels on both versions. 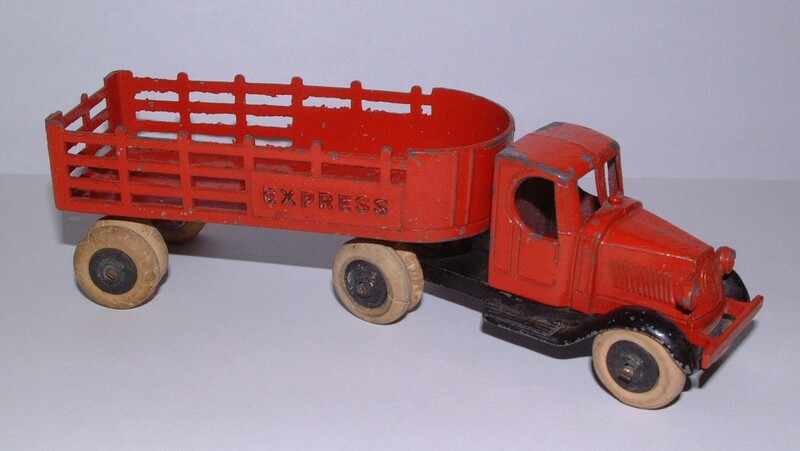 "EXPRESS" cast on trailer sides. 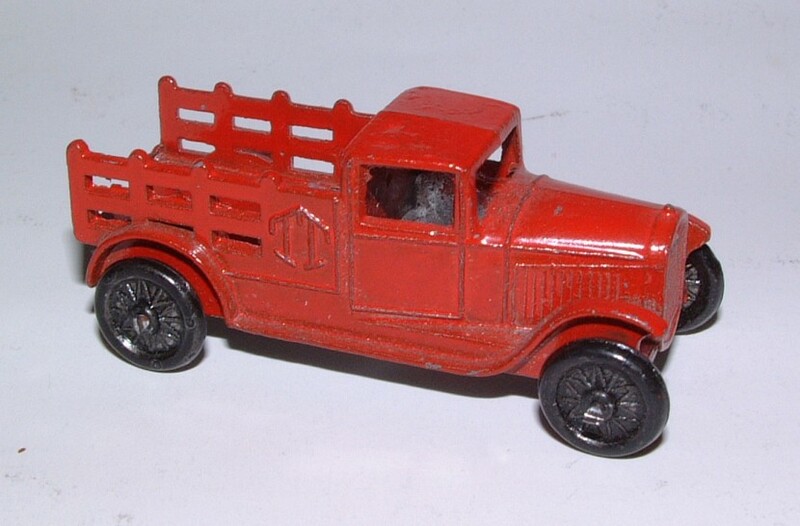 1st type tractor with separate chassis and dual rear wheels on tractor and trailer. 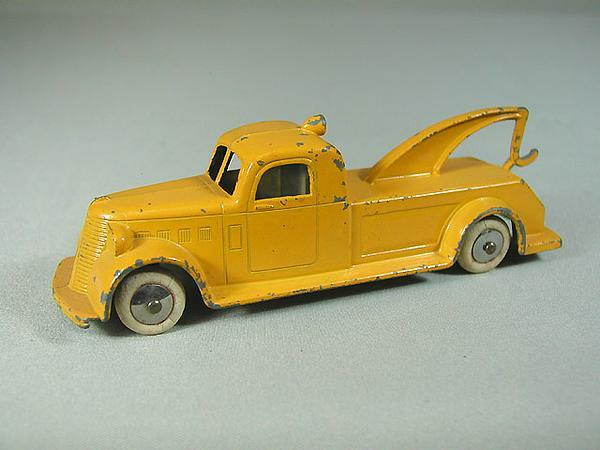 2nd type one-piece tractor and single rear wheels on tractor and trailer. 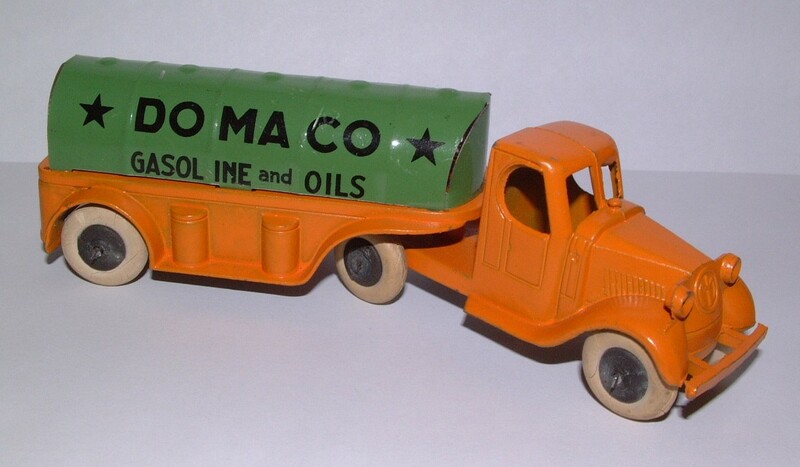 "DOMACO GASOLINE & OILS" on trailer sides. 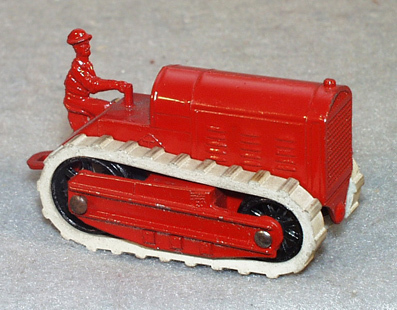 1st type tractor with separate chassis and dual rear wheels on tractor and trailer. 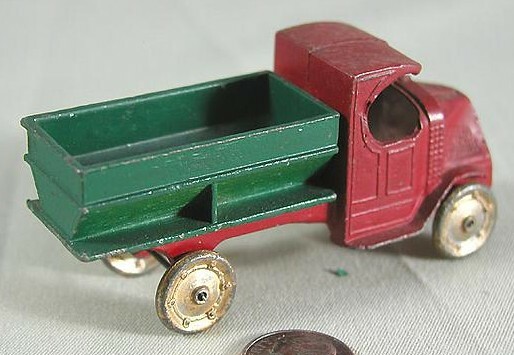 2nd type one-piece tractor and single rear wheels on tractor and trailer. 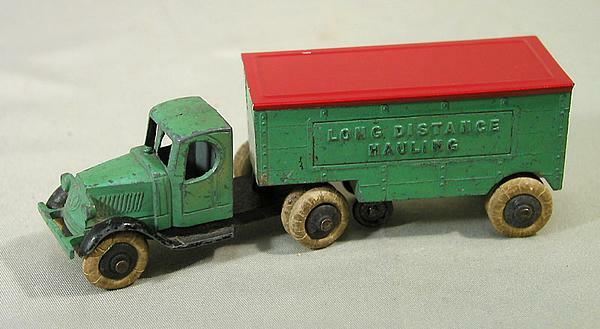 "LONG DISTANCE HAULING" cast on trailer sides. 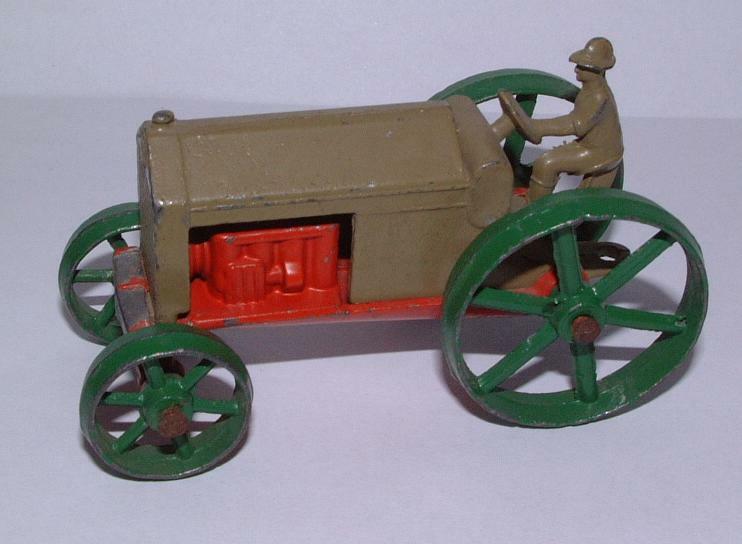 1st type tractor with separate chassis and dual rear wheels on tractor and trailer. Probably not issued in the 2nd type. "CITY FUEL COMPANY" cast on sides. 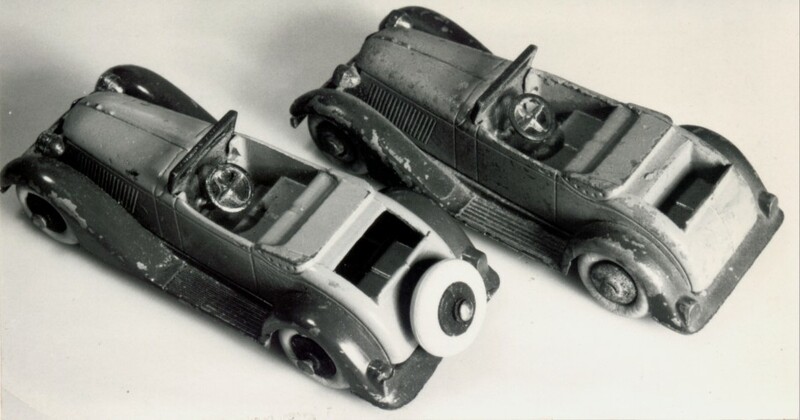 1st type with separate chassis and dual rear wheels. 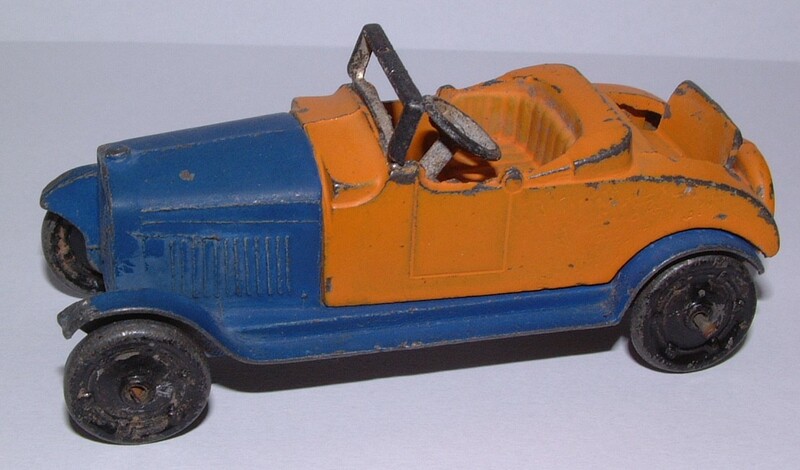 Four wheel version from 1936, at first with a separate chassis, then a single cab/chassis casting. 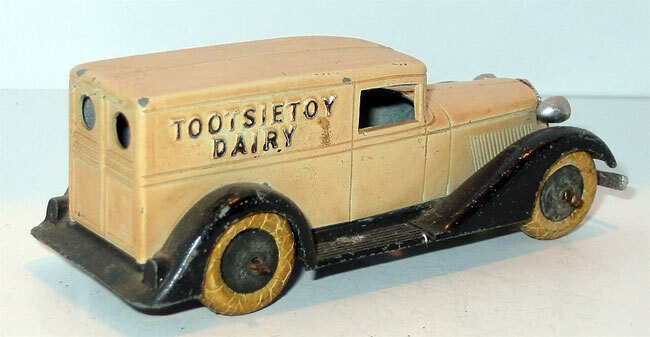 "TOOTSIETOY DAIRY" on trailer sides. 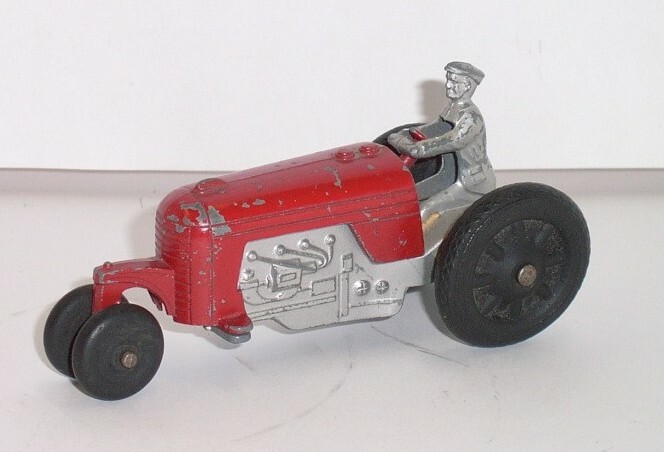 1st type tractor with separate chassis and dual rear wheels on tractor and trailer. 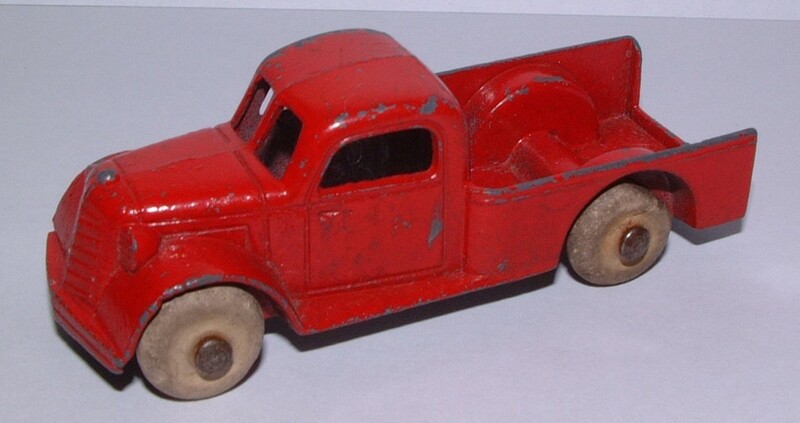 2nd type one-piece tractor and single rear wheels on tractor and trailer. Adapted from 5103. 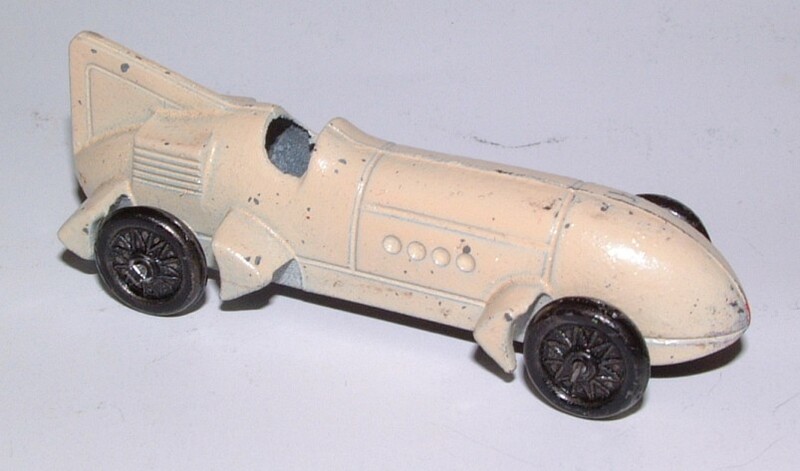 Curiously, the catalogue number was actually 0807, although the model did not have rubber tyres. 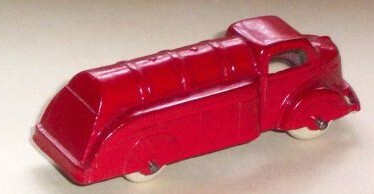 1939 98 "TOOTSIETOY DAIRY" cast on sides. 1939 98 "COMMERCIAL TIRE & SUPPLY CO." cast on sides. 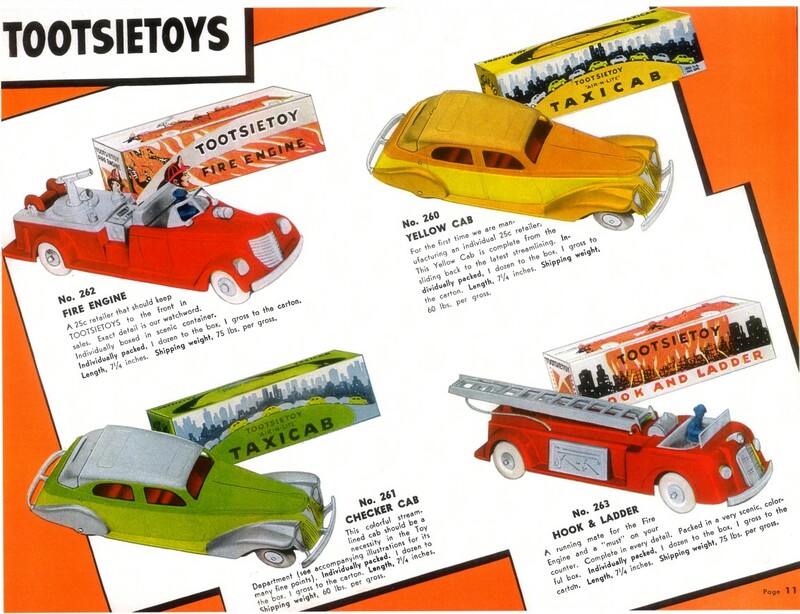 Sold only in boxed sets 5300 'Tootsietoy Motors' (1935) and 5360 'Bild-a-Car' (1938-9). 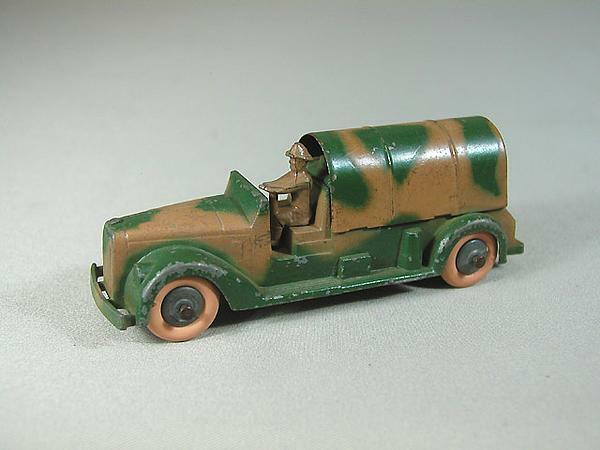 1941 98 After 1938 sold in no.5220 Army Set. 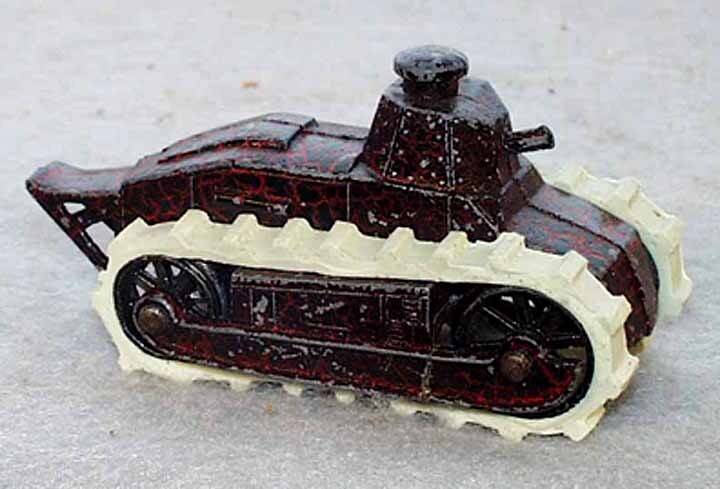 Re-introduced as a single item in 1941 in camouflage paint. 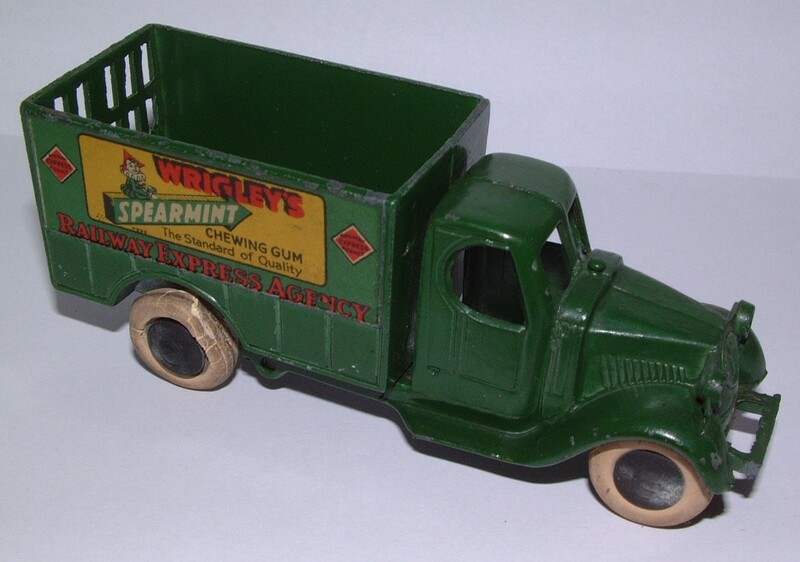 "WRIGLEY'S SPEARMINT CHEWING GUM The Standard of Quality RAILWAY EXPRESS AGENCY" transfer on sides. 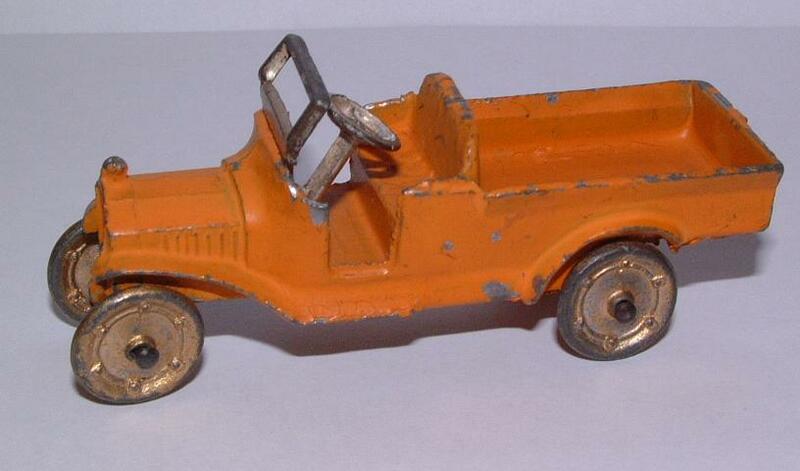 1st type with a separate chassis, 2nd type a single cab/chassis casting, single rear wheels on both versions. Jumbo series was called 'Torpedo' in 1940 and later. "WRIGLEY'S SPEARMINT CHEWING GUM The Flavor Lasts" transfer on sides. Later issued without transfer and called 'Large Box Truck'. Red and silver or green and silver, black rubber wheels. Vague resemblance to an Auburn. With or without tin baseplate. "GREYHOUND" cast on sides. Single colours. No.1045 in different packaging. 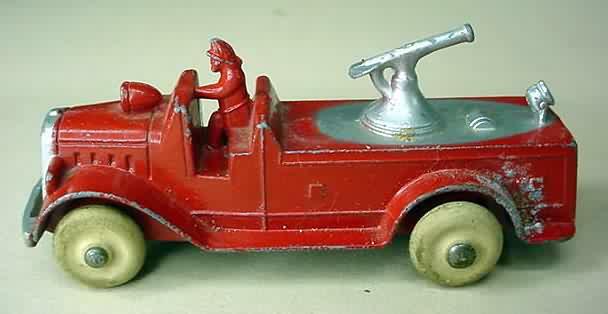 With driver and three ladders. 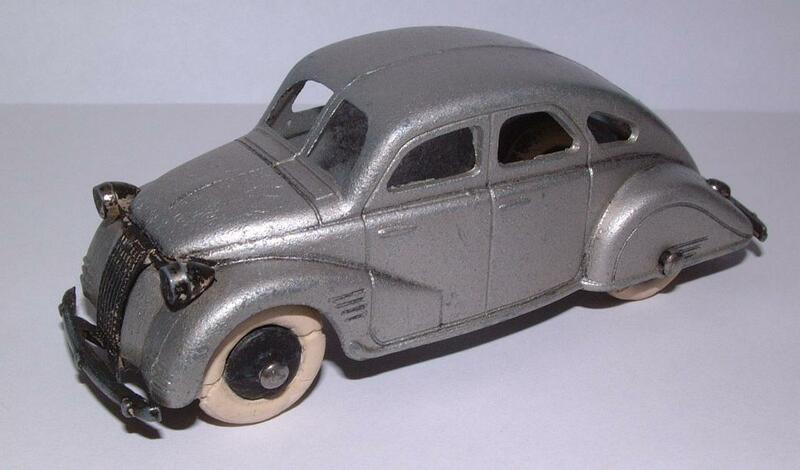 Reissued in 1948 with closed wheel arches. 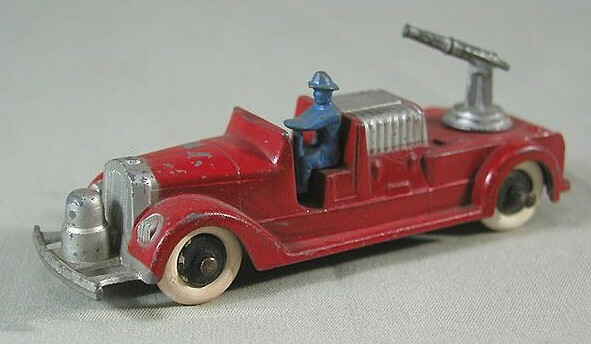 With driver and water cannon. 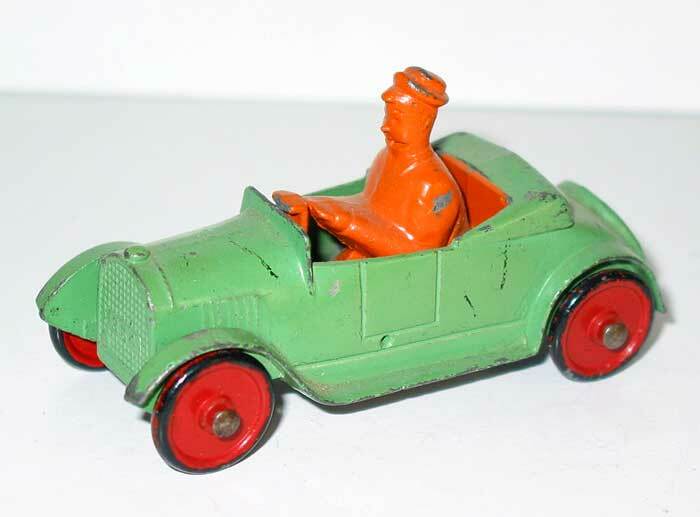 Man at rear from 1938 on. 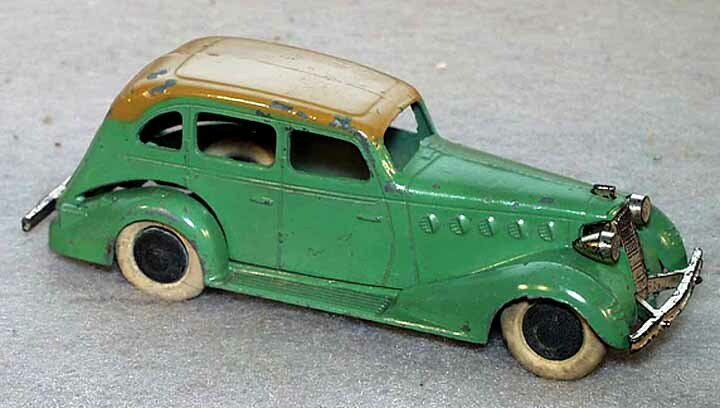 Reissued in 1948 with closed wheel arches. With driver. 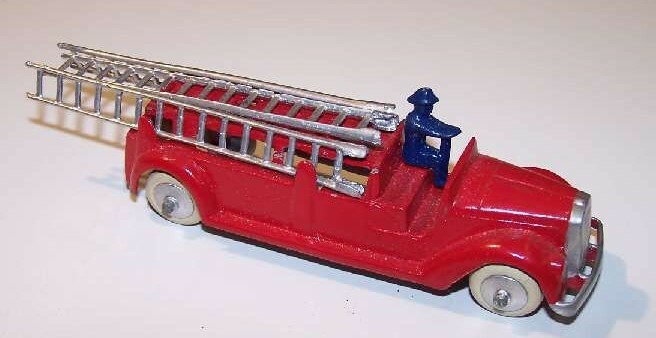 Single ladder and man at rear from 1938 on. 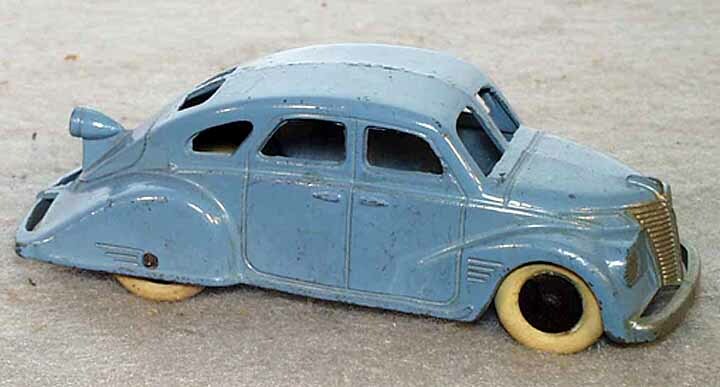 Reissued in 1948 with closed wheel arches. "GREYHOUND" cast on sides, blue and silver. With or without tin baseplate. See also no.1026. "TRANS-AMERICA" cast on sides, red and silver or red and cream. 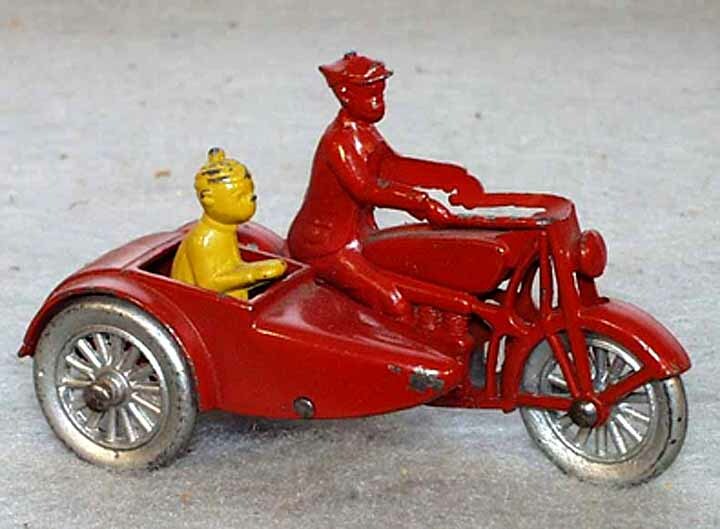 Shown only in 'Jumbo Set' no.750 in 1941 catalogue. "TOOTSIE" cast on sides, tin baseplate. The larger one. Two colours and silver trim with white tyres and chrome hubs pre-war. Adapted from 1042. Only in sets in 1939-40. A smaller version of 1010 without adverts. Later modified with added lights and detail. Driver and ladders integrally cast. Two colours and silver trim pre-war. '260' series Shown in the 1941 catalogue but never produced. Air-N-Lite Paramount cab. Never produced. Same casting as above. Never produced. A water cannon. Never produced. Single extension ladder. Never produced. 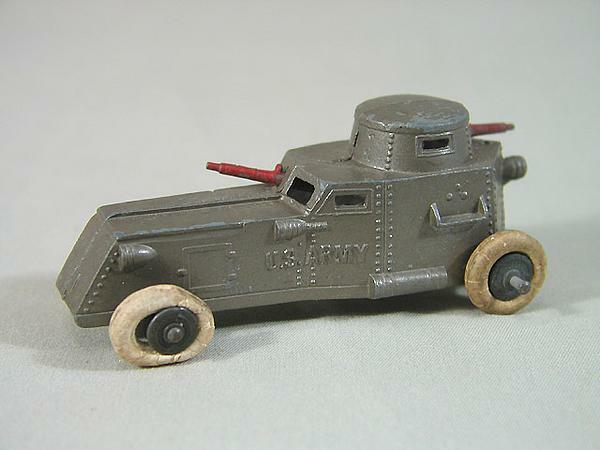 * The asterisk denotes that the model continued in production after 1941 or was reintroduced after the war. 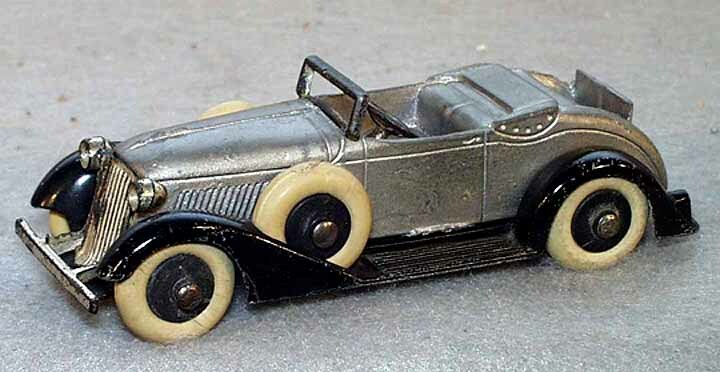 In such cases, wheels were black rubber and paint usually monochrome. Thus endeth the lesson. Irate corrections, comments, additions and condemnations will be gratefully received. I ask only that they be carefully and accurately documented, preferably accompanied by the evidence. Especially the condemnations.